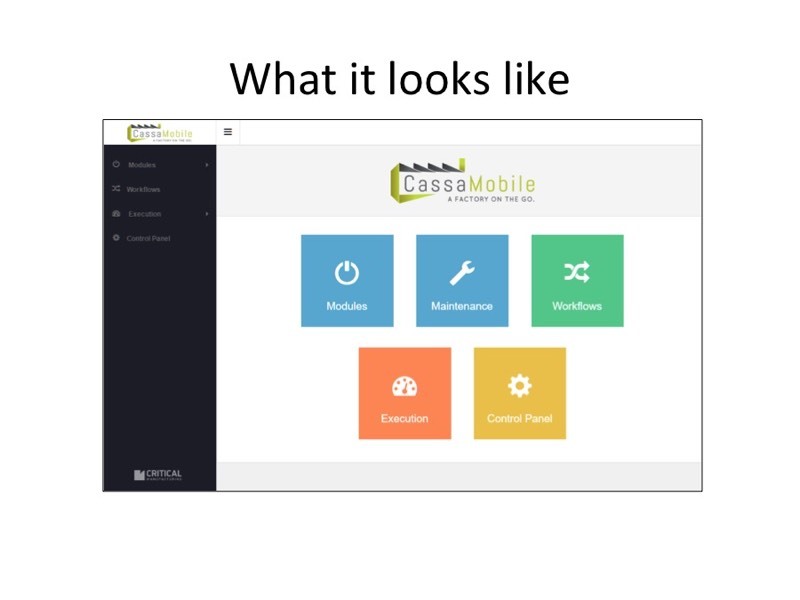 CassaMobile created various types of output, such as deliverables, brochures, peer reviewed articles, conference presentations and multimedia productions. 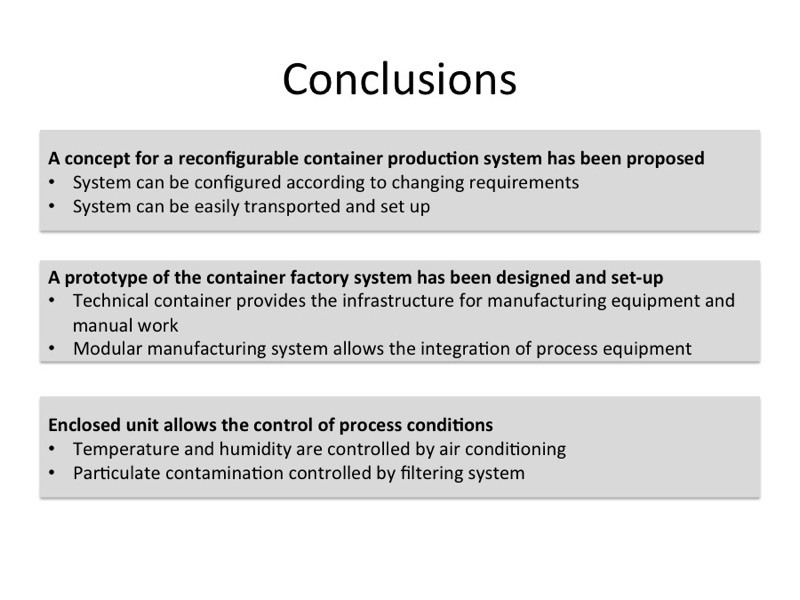 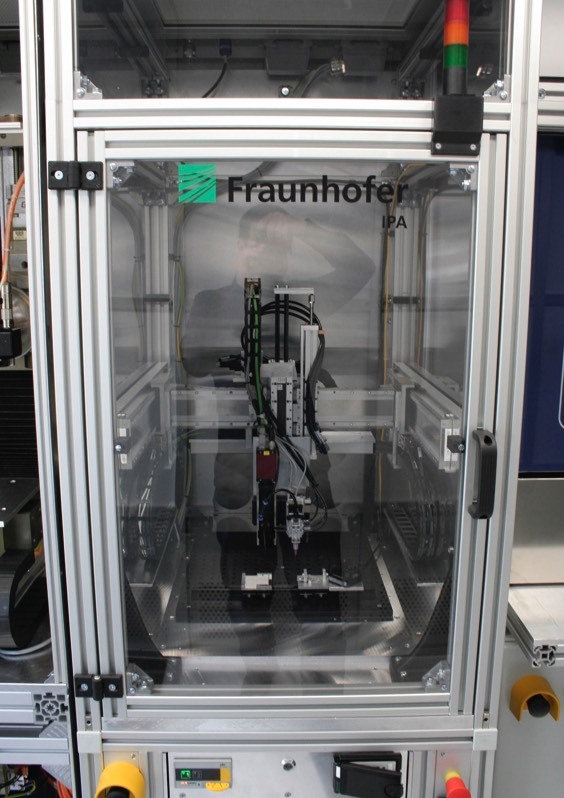 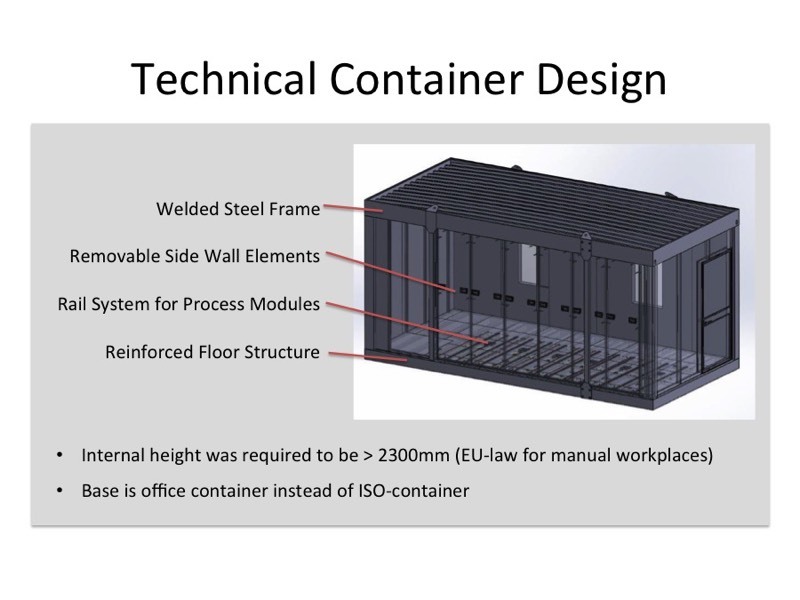 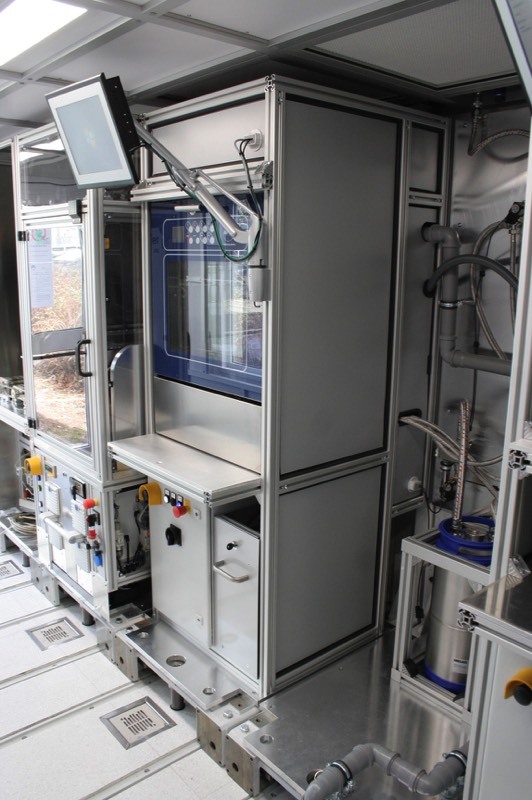 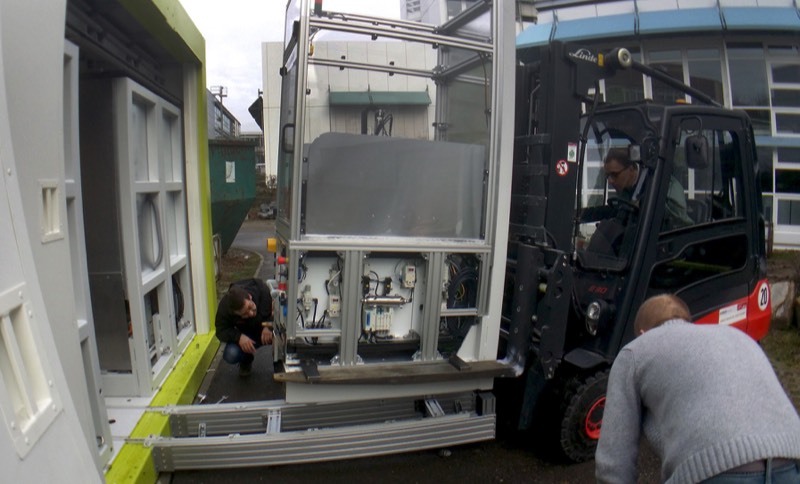 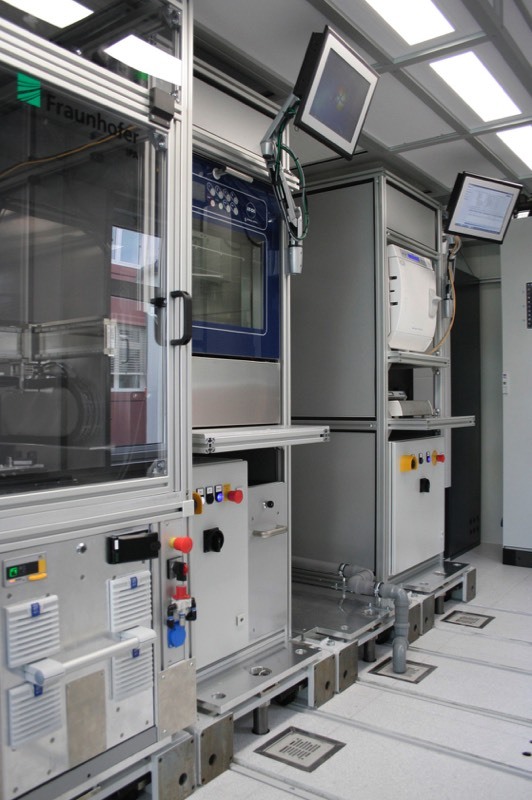 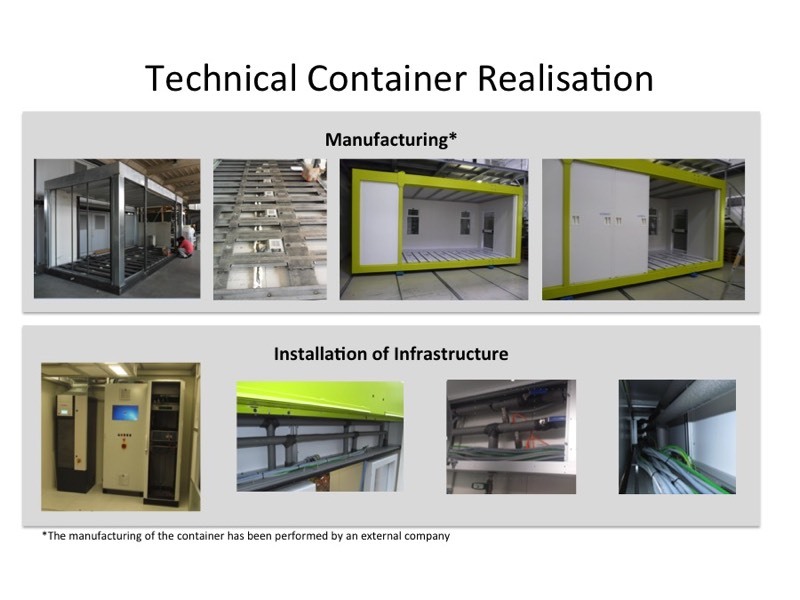 The Container Blog followed the development of the actual container at the Fraunhofer IPA facilities in Stuttgart. 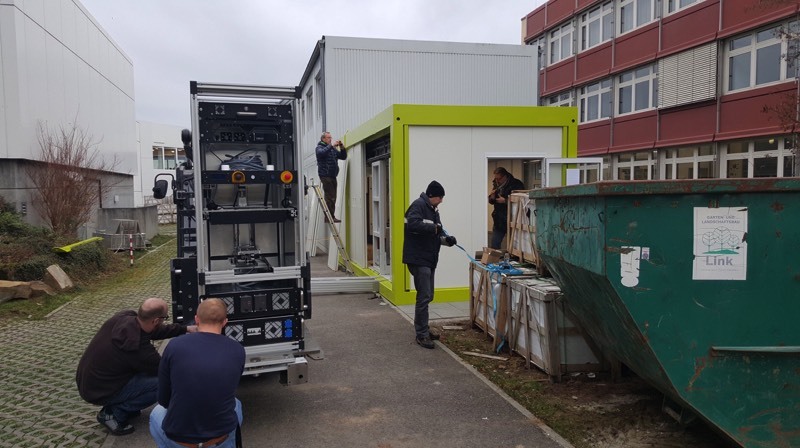 The container demonstration during our final workshop was a great success and everyone attending was able to see all modules at work. 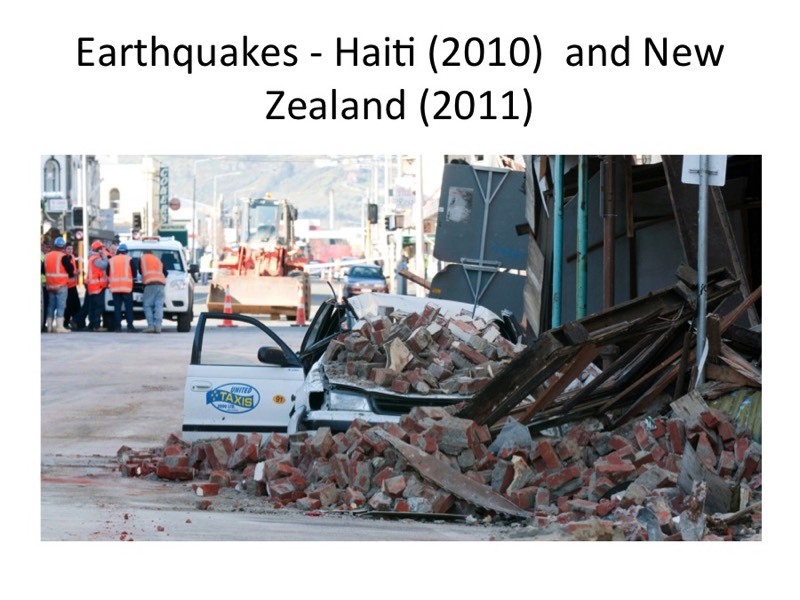 On the right you will find a selection of pictures of this event. 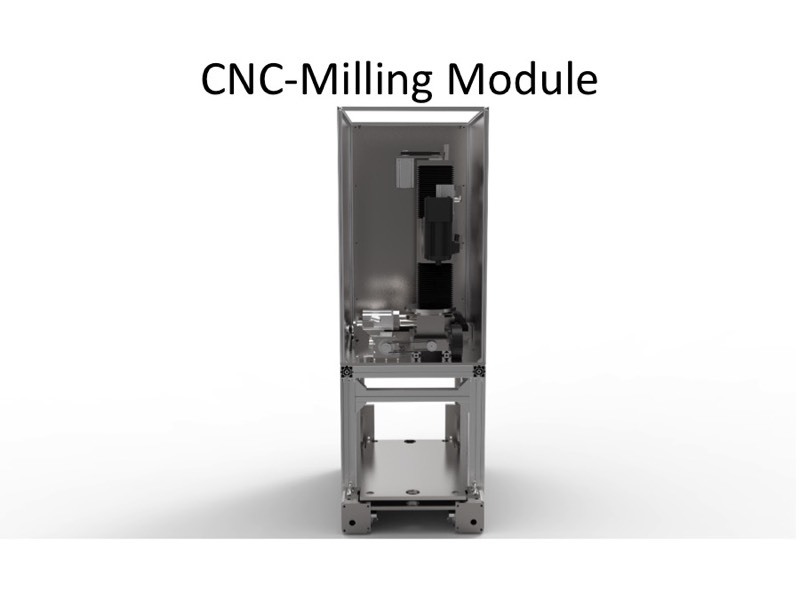 More can be found on its dedicated page. 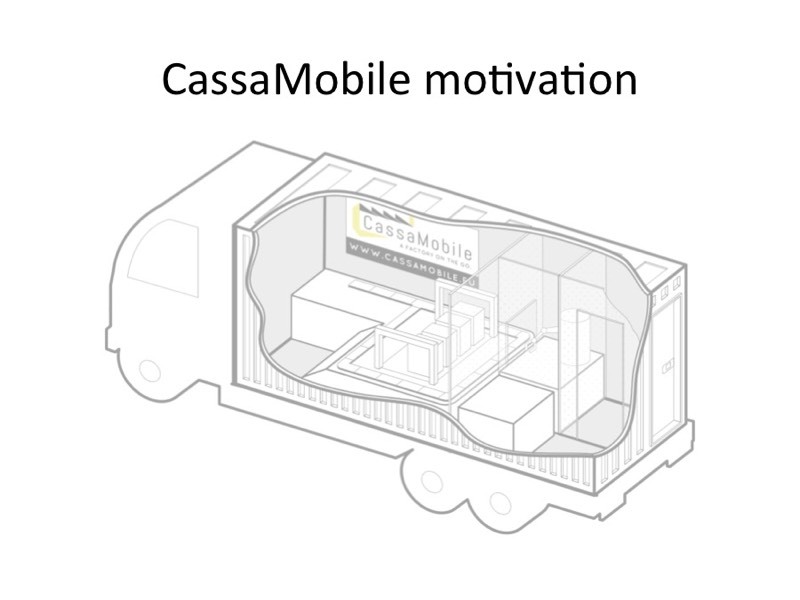 The CassaMobile consortium agreed to extend their collaboration towards a successful commercialisation and use of the CassaMobile concept. 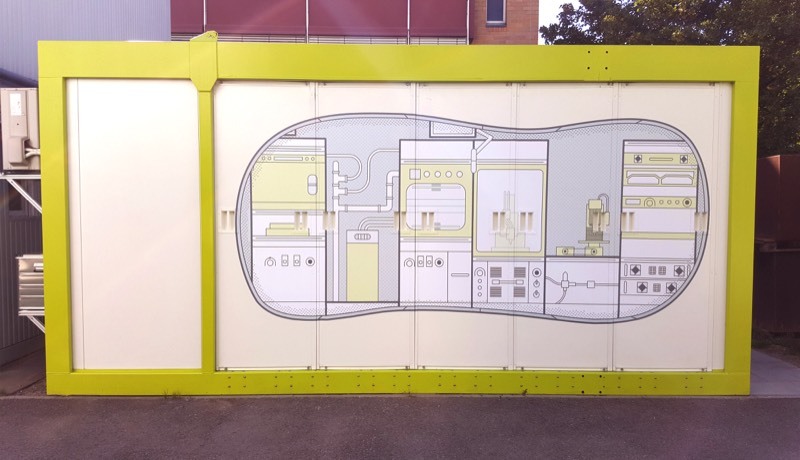 Click on this picture to launch a slideshow! 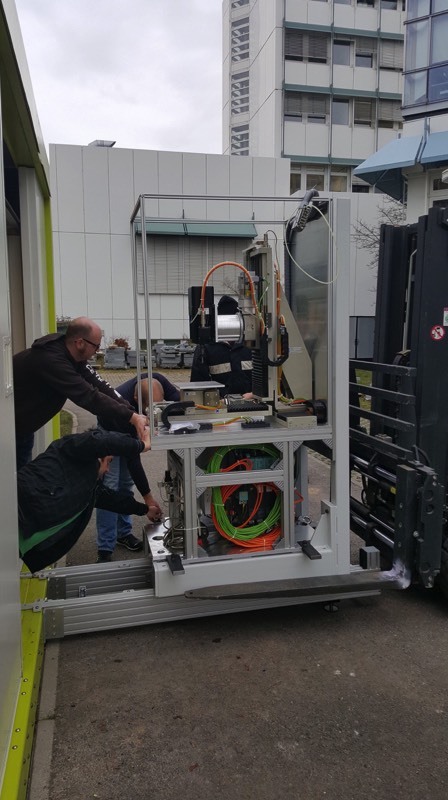 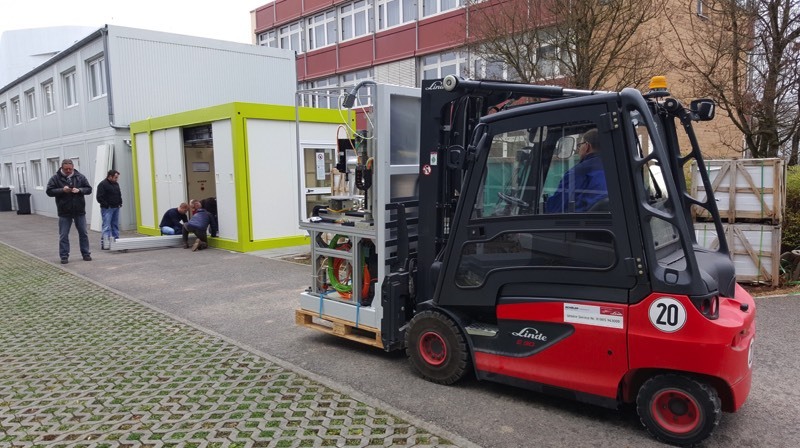 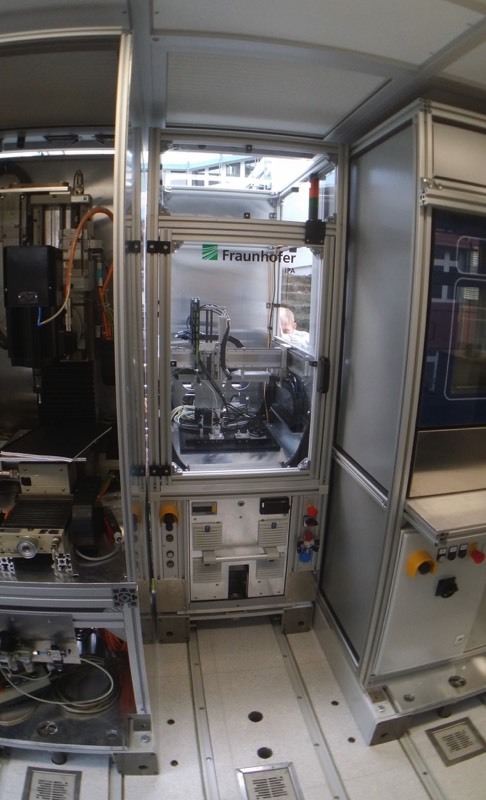 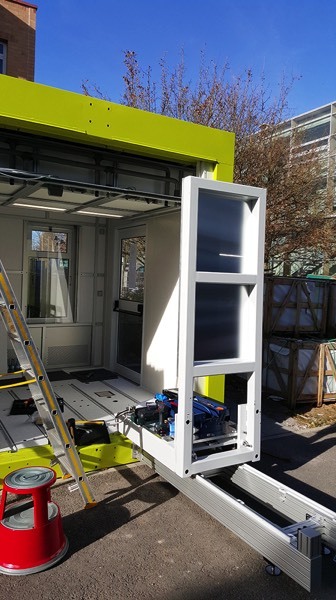 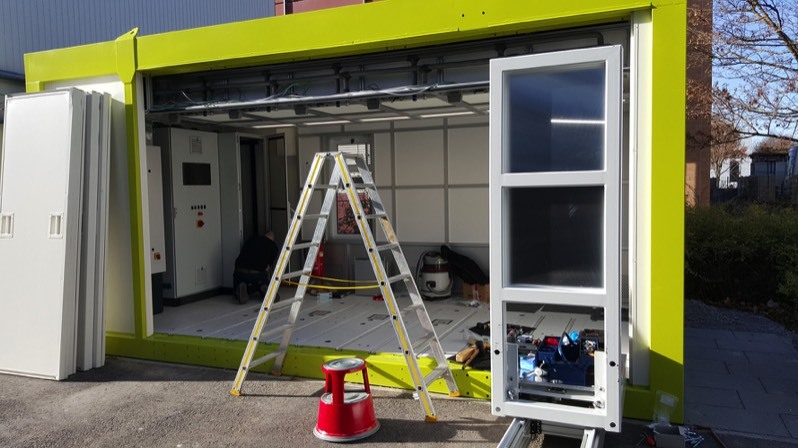 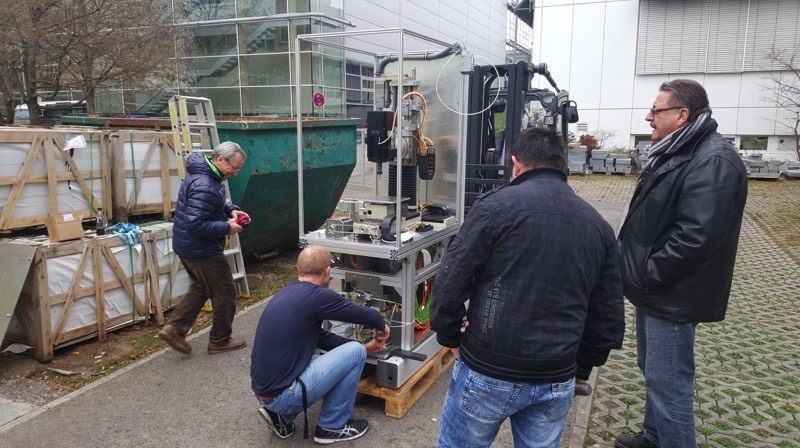 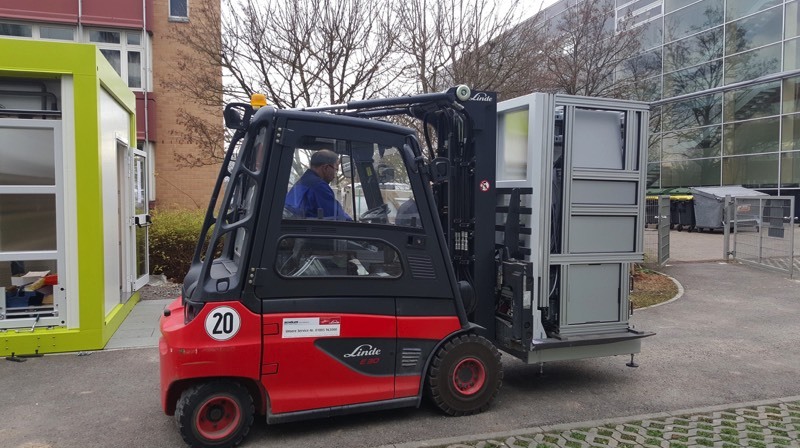 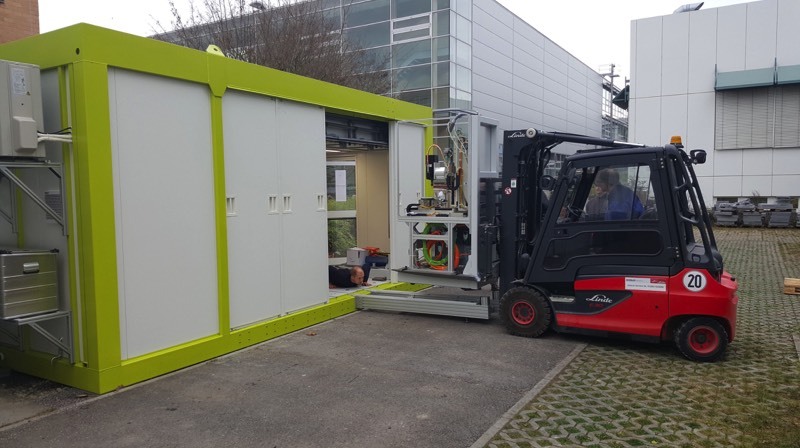 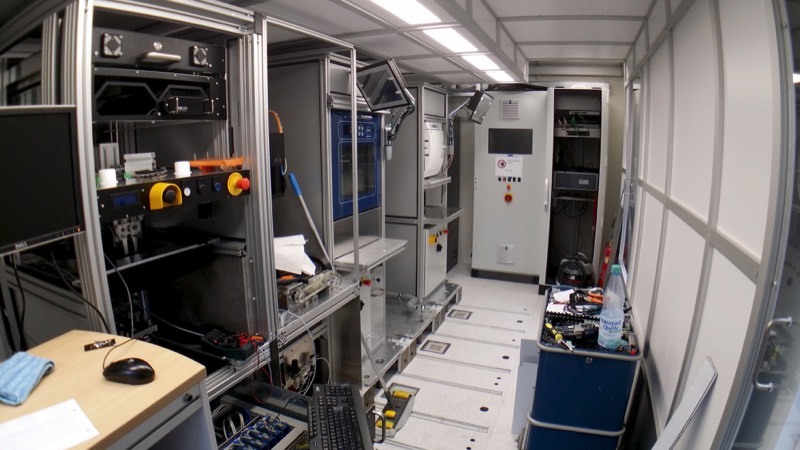 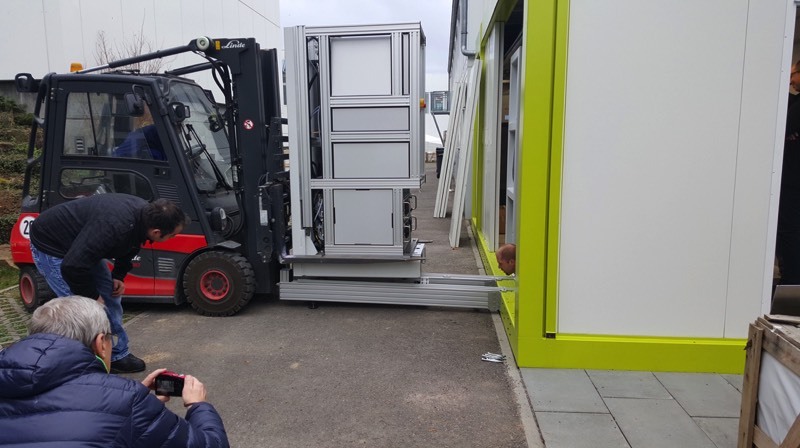 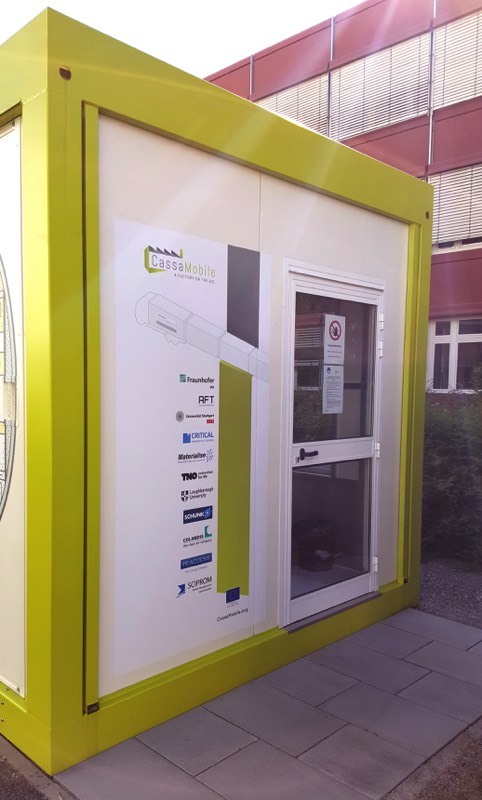 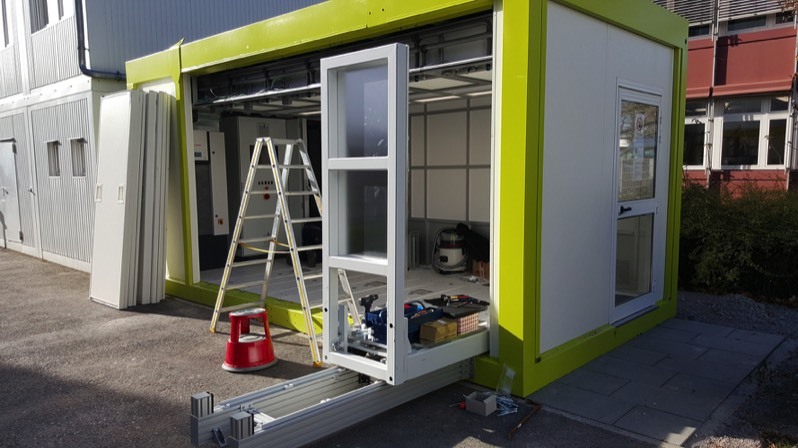 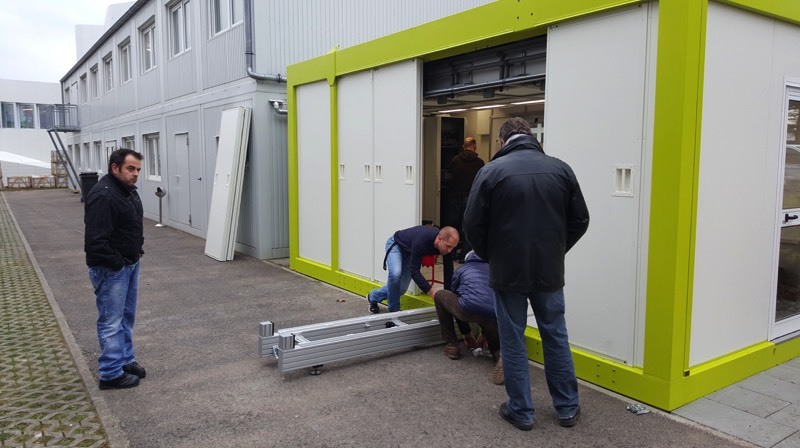 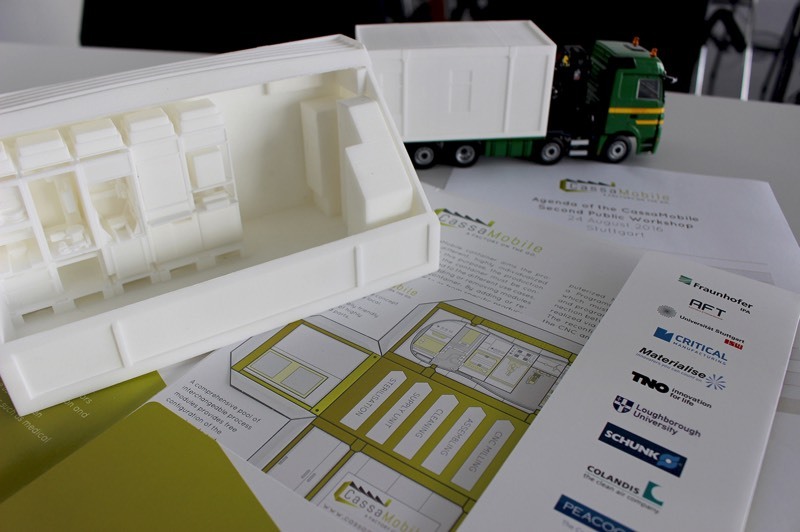 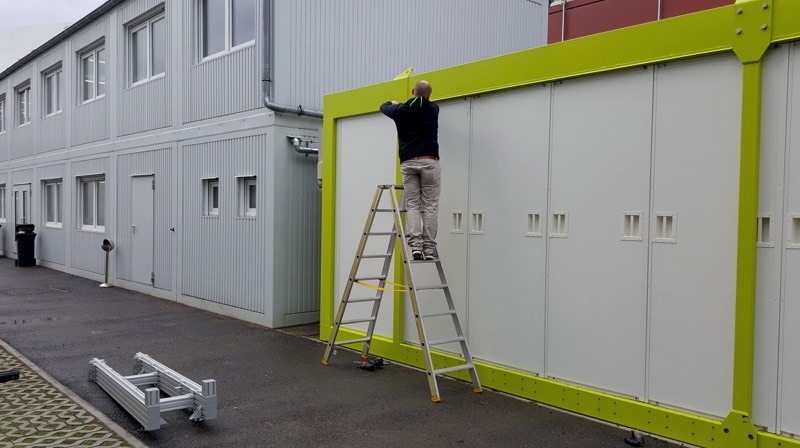 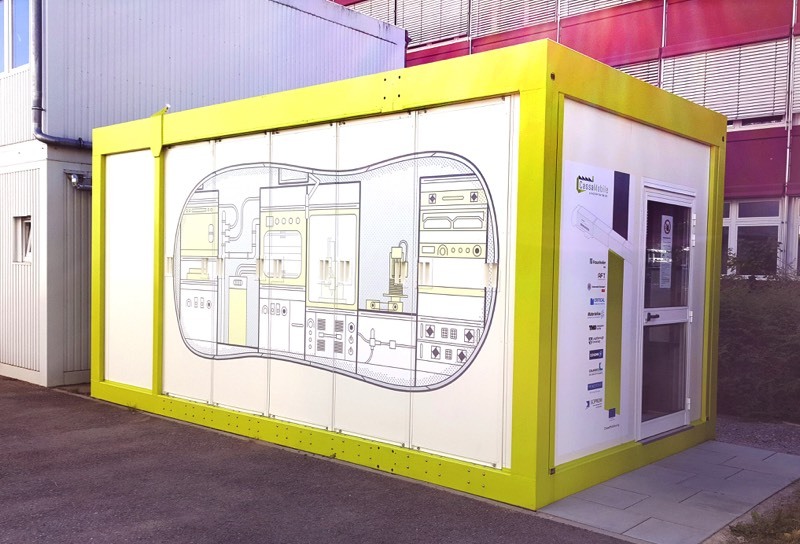 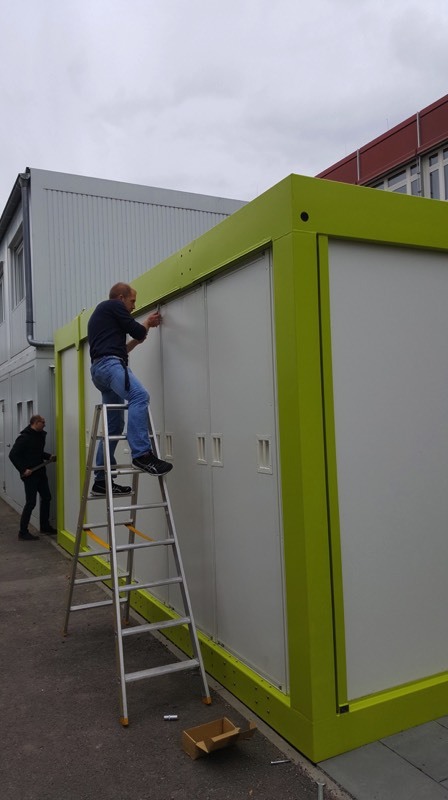 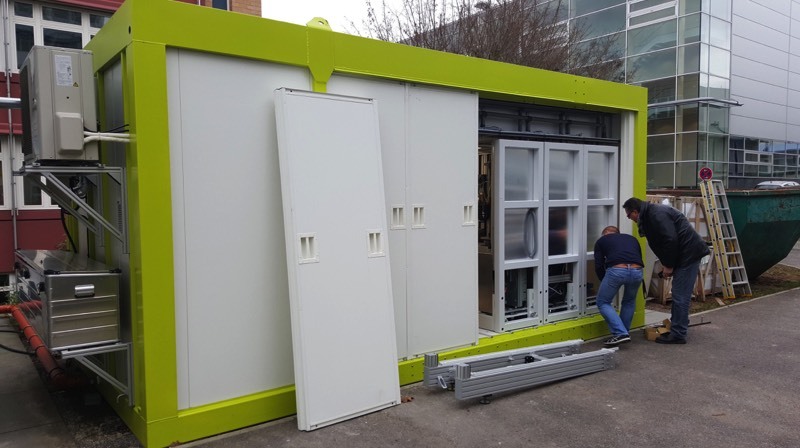 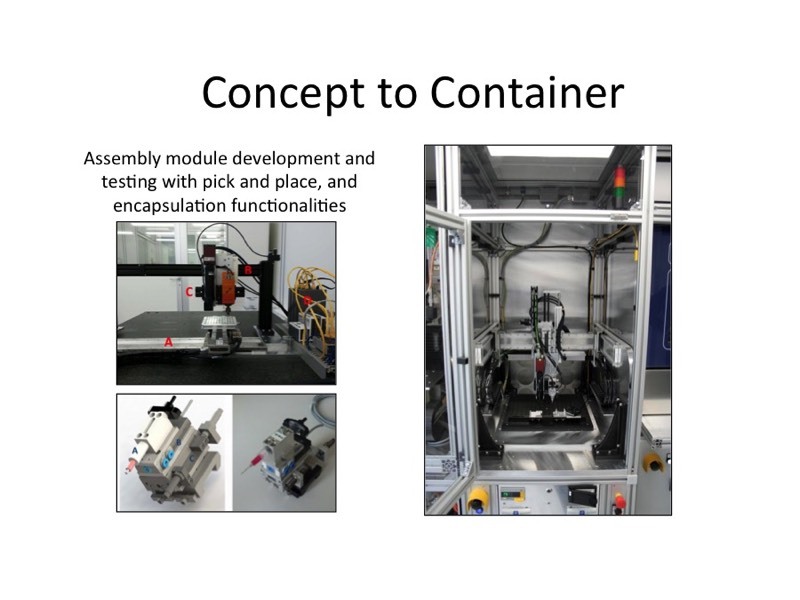 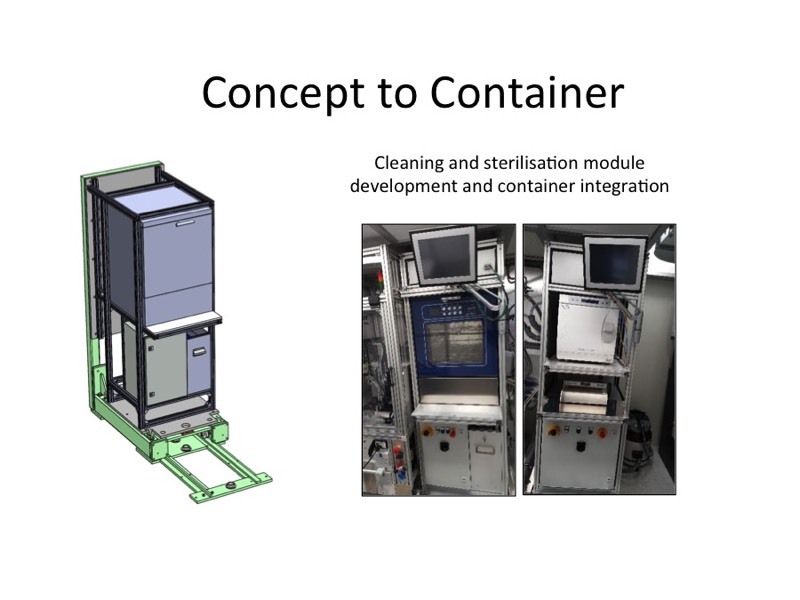 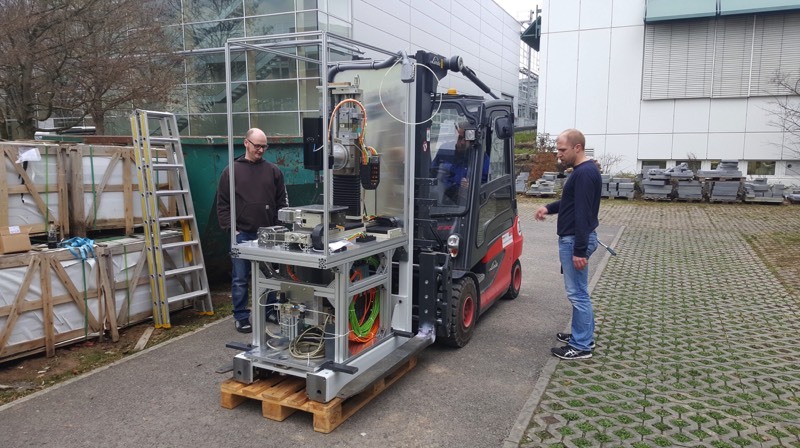 In Stuttgart, at the Fraunhofer IPA facilities, everything is ready for the public live demonstration of the container, that will occur during the final workshop. 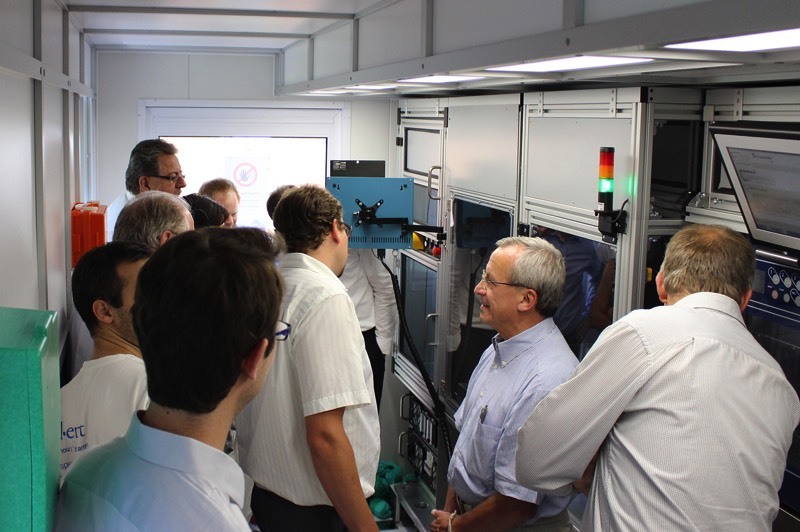 Pictures of the event can be found on its dedicated page. 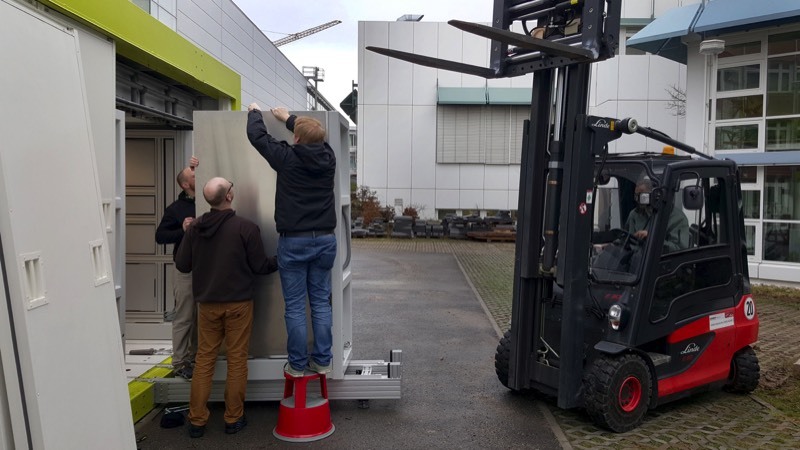 Preparations for the "Hackathon" next week are in full swing. 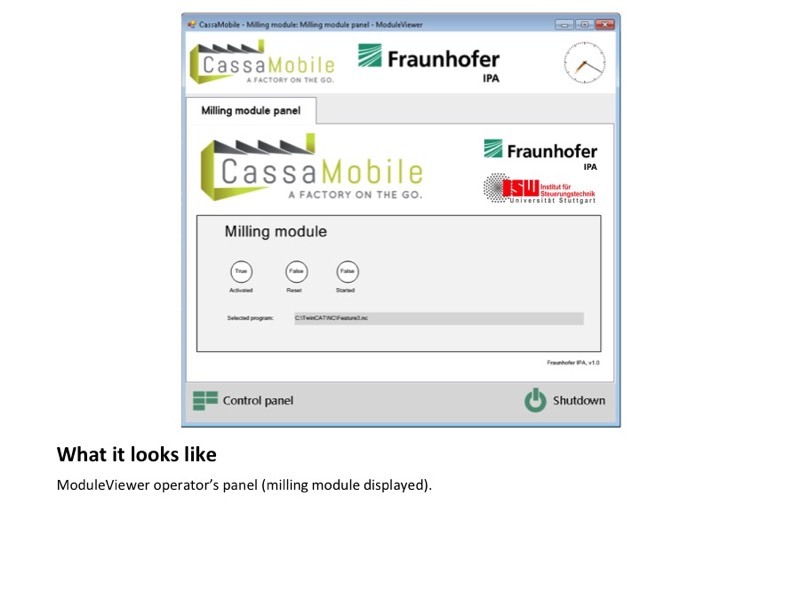 By now, all process modules are fully tested, configured and parameterized. 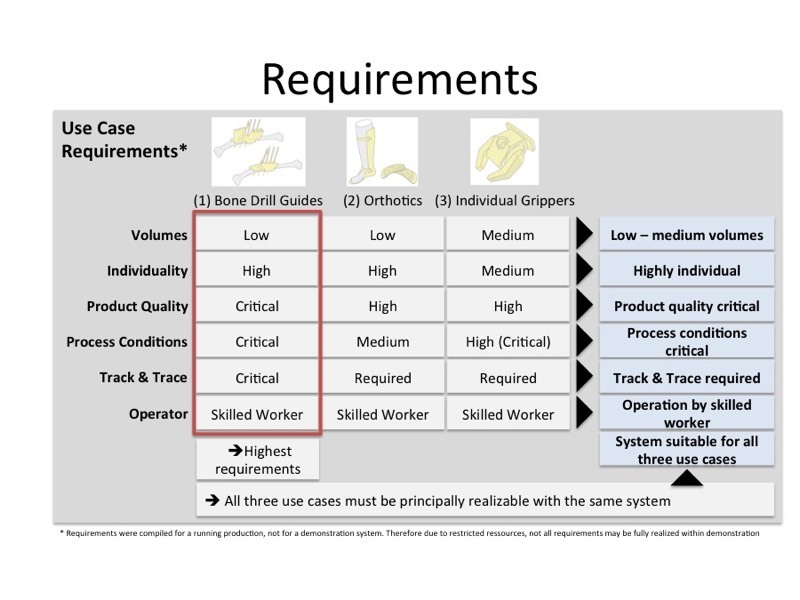 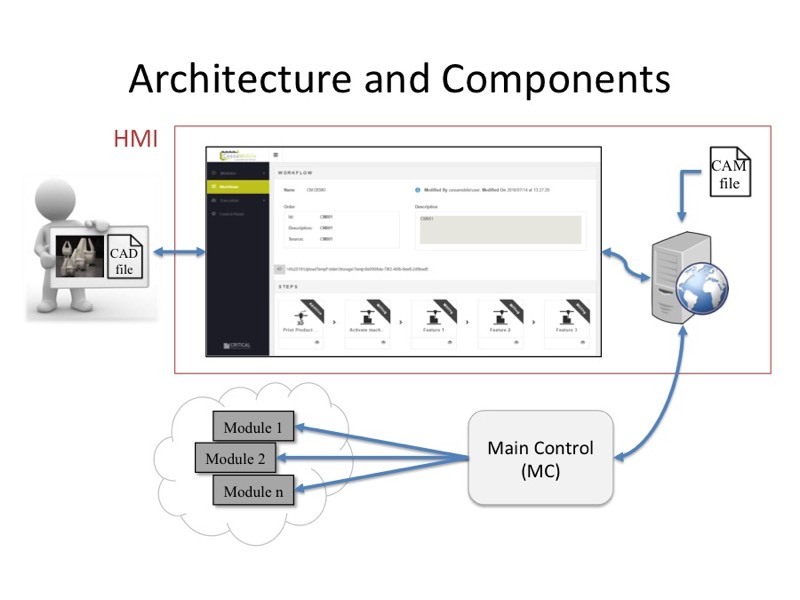 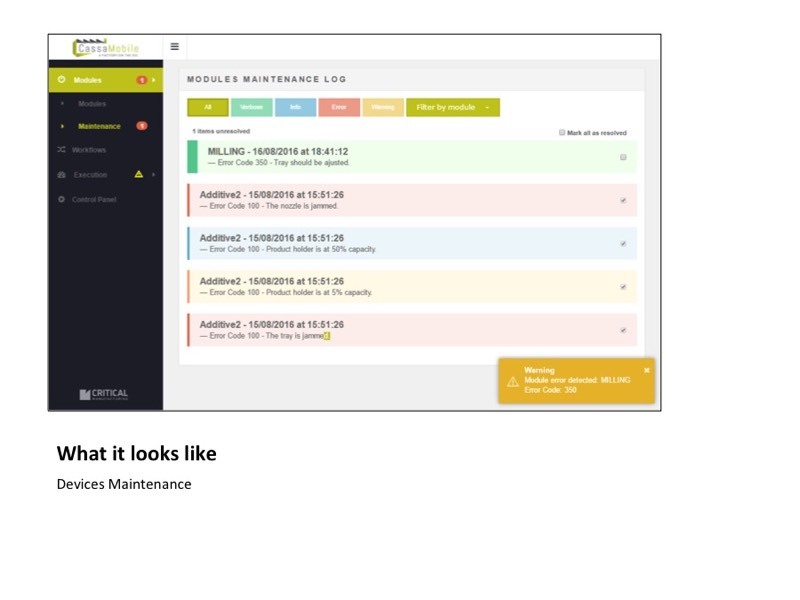 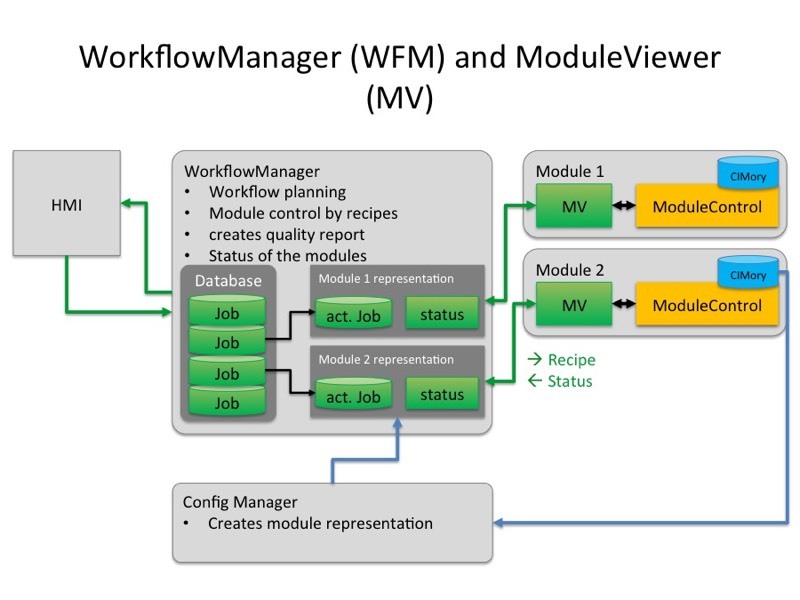 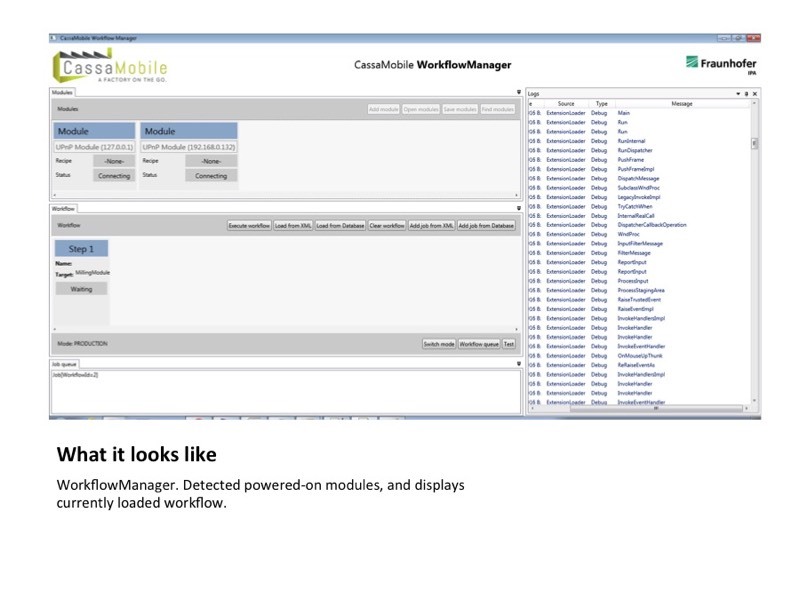 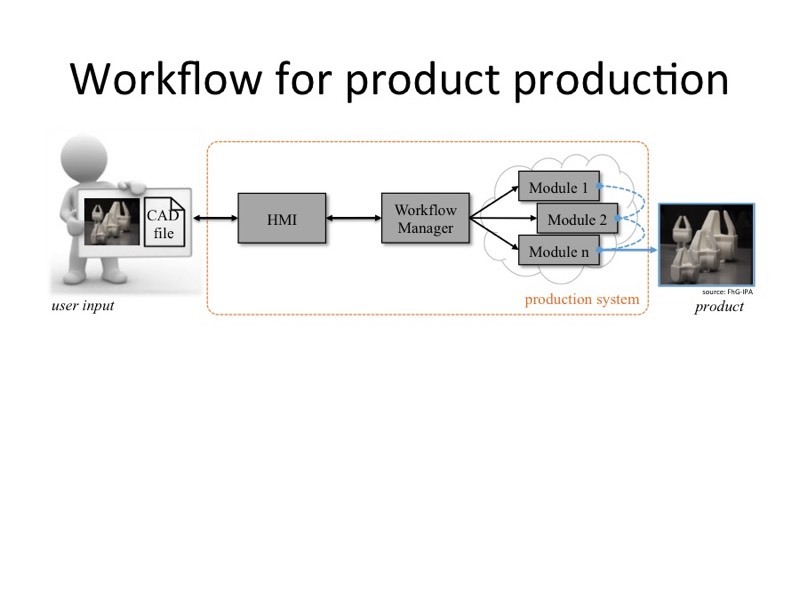 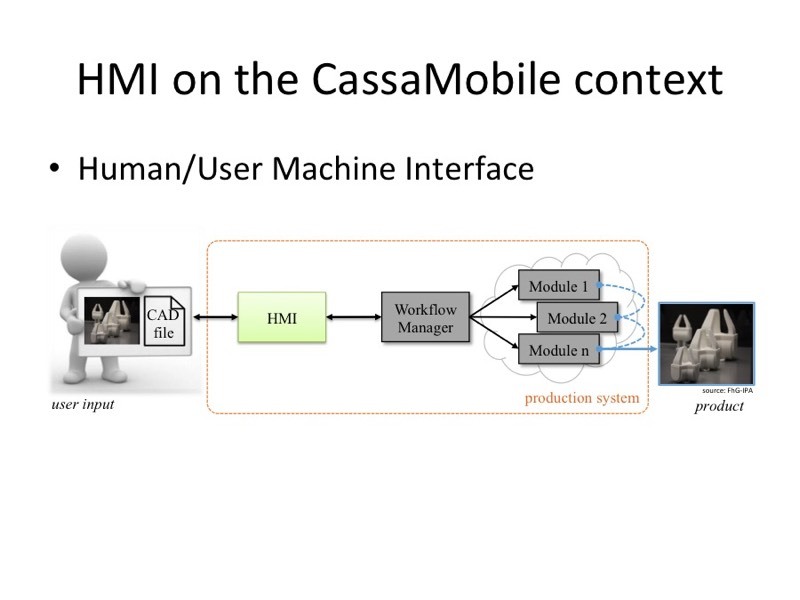 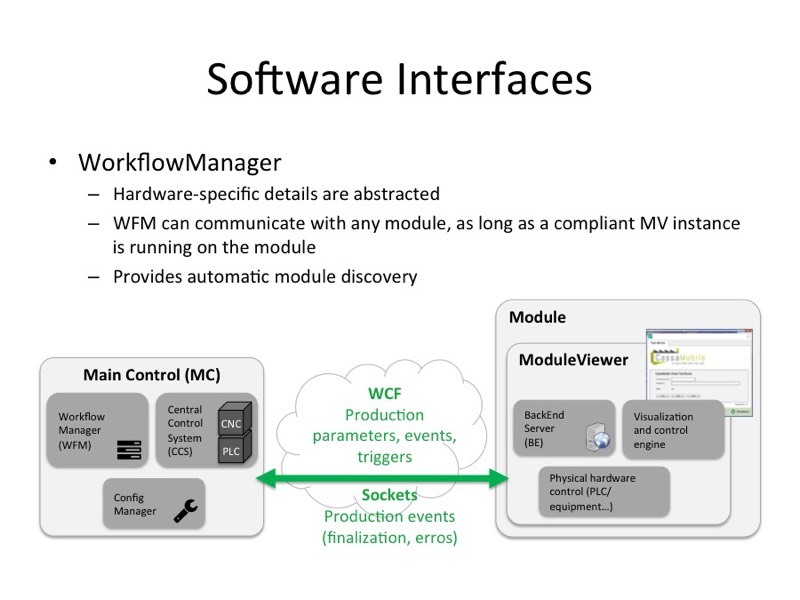 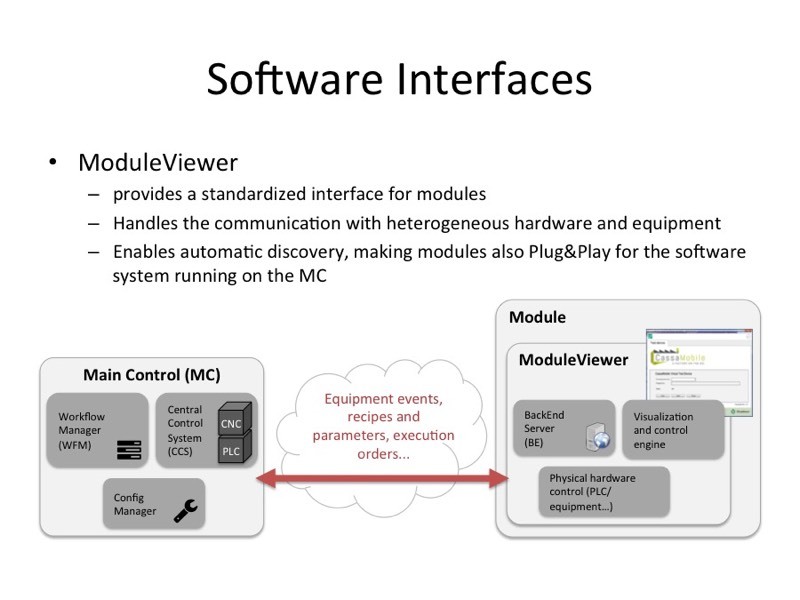 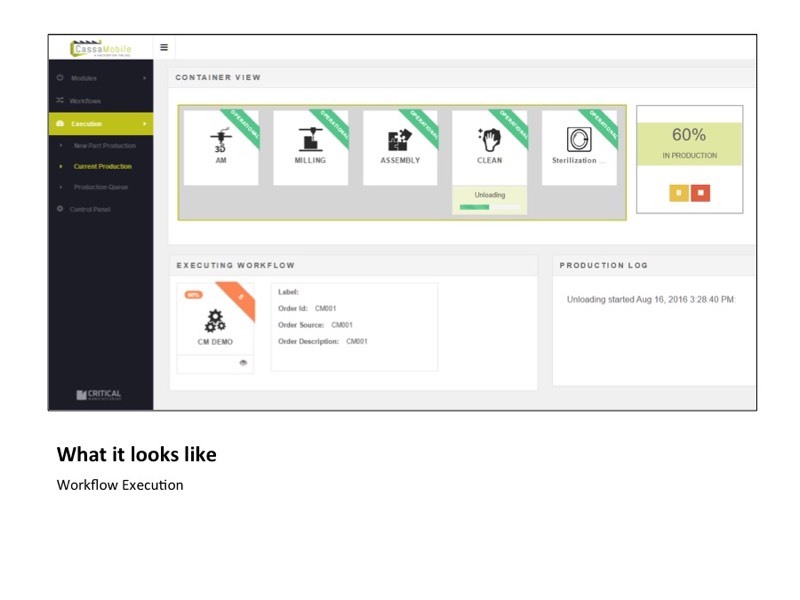 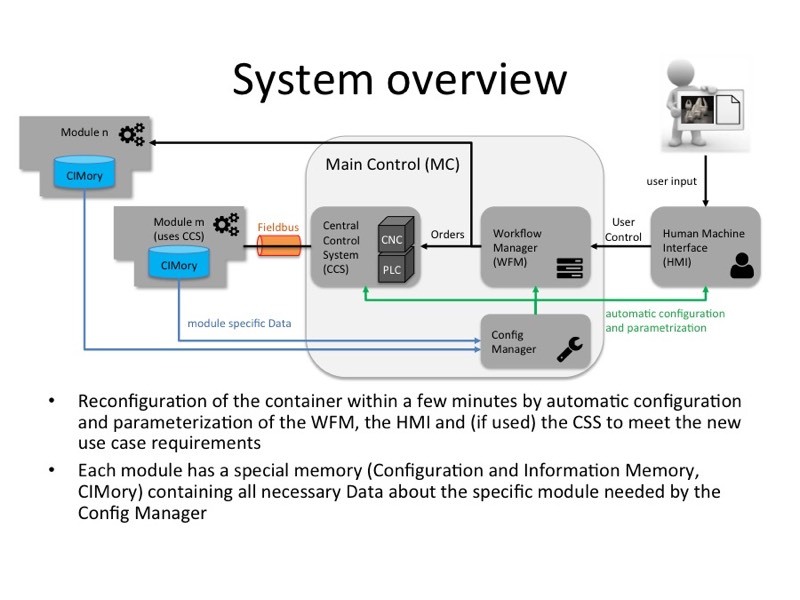 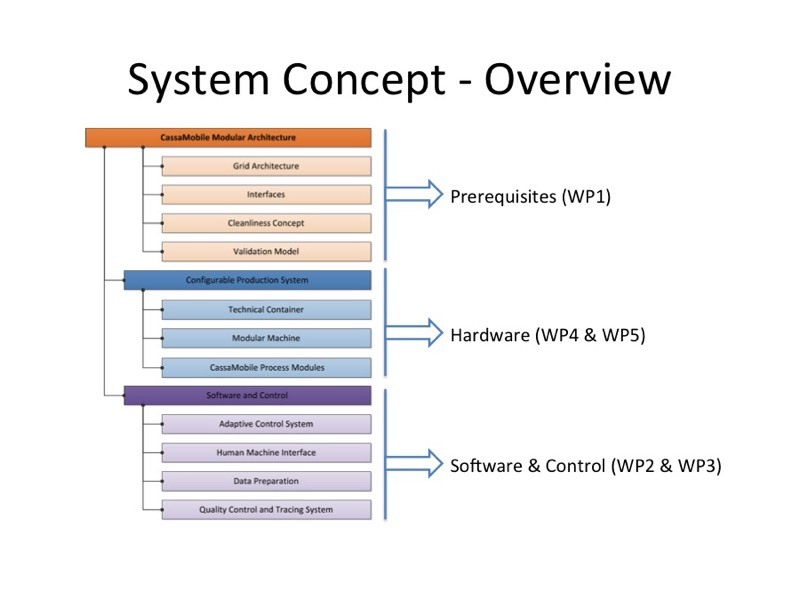 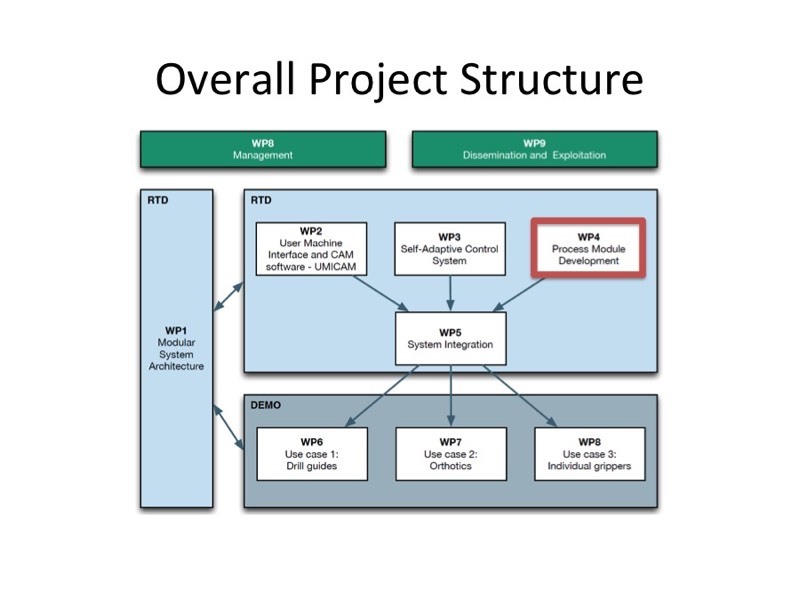 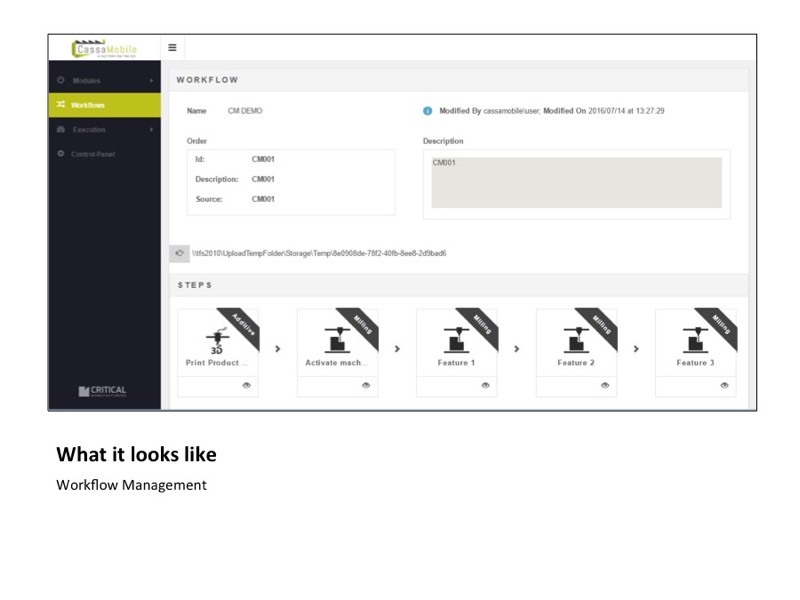 In a next step, all process modules will be connected to the Workflow Manager and visualized via the Human machine Interface (HMI). 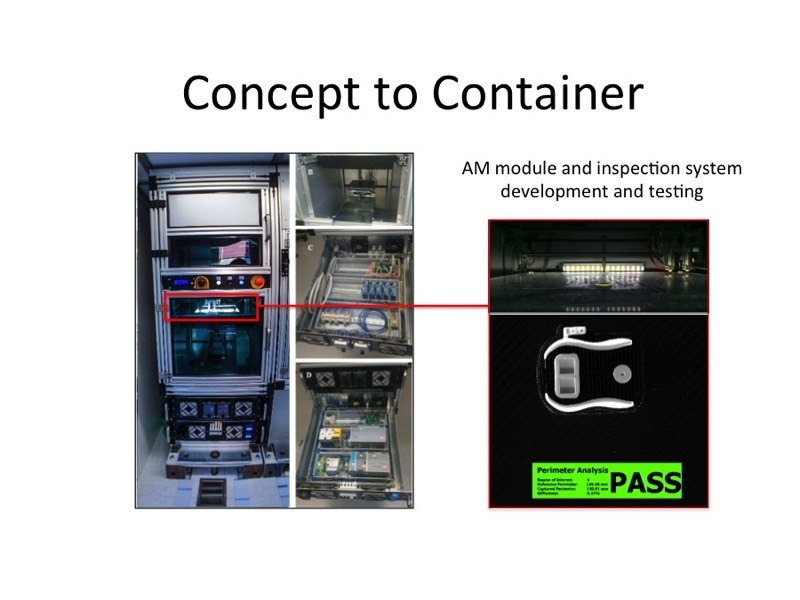 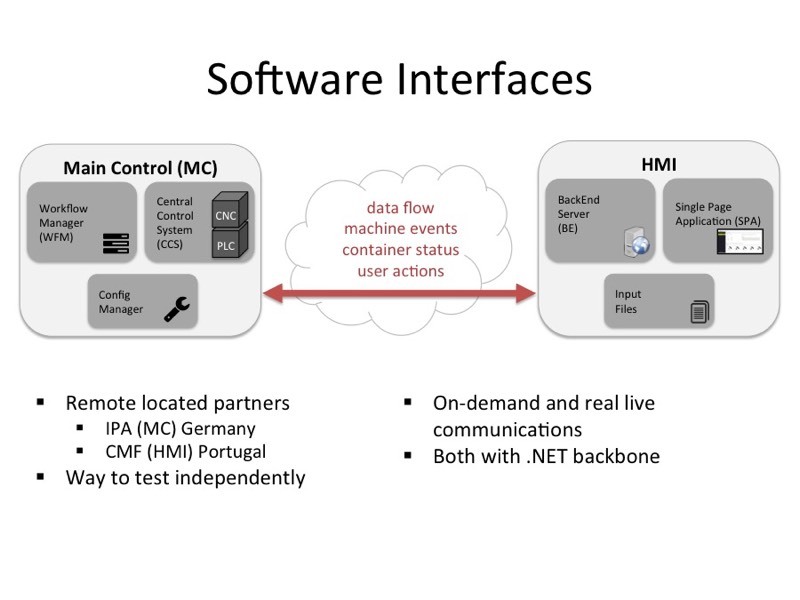 During the “Hackathon", teams from Portugal, Belgium and Germany will be testing the final connection to the HMI directly in the container. 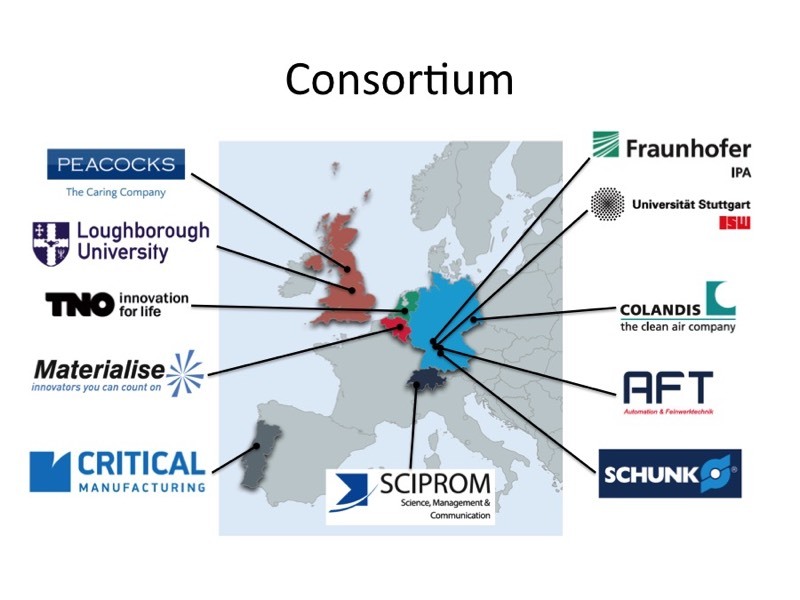 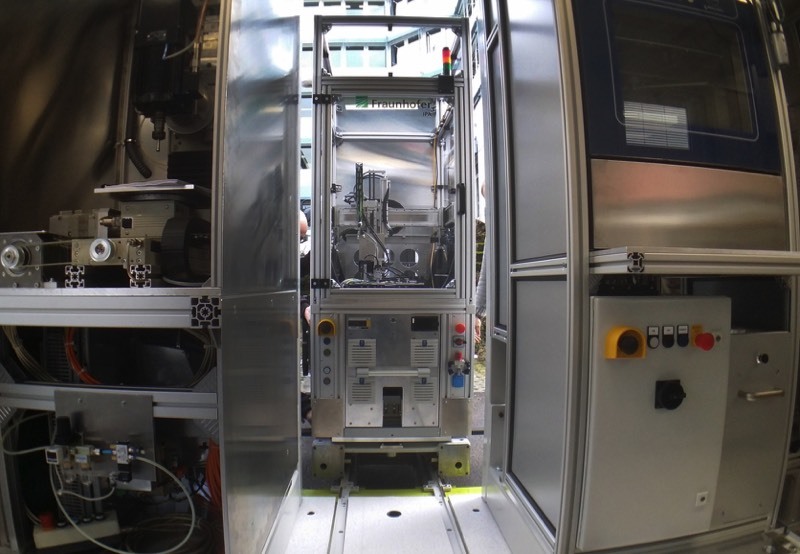 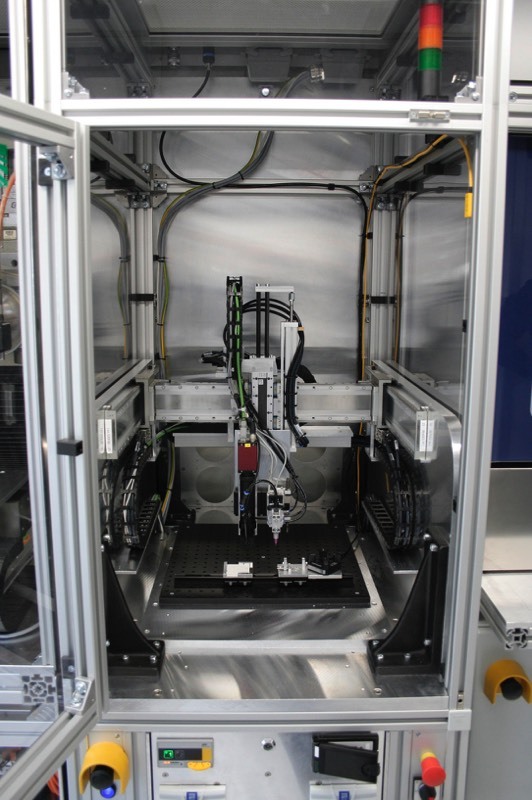 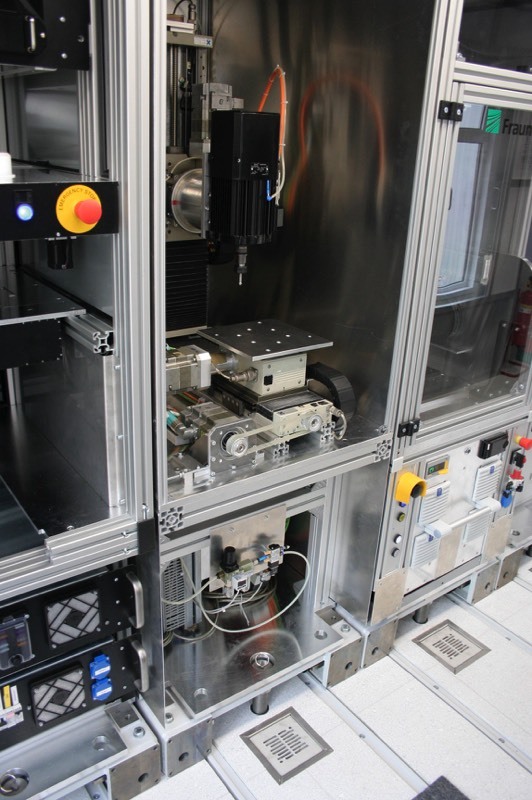 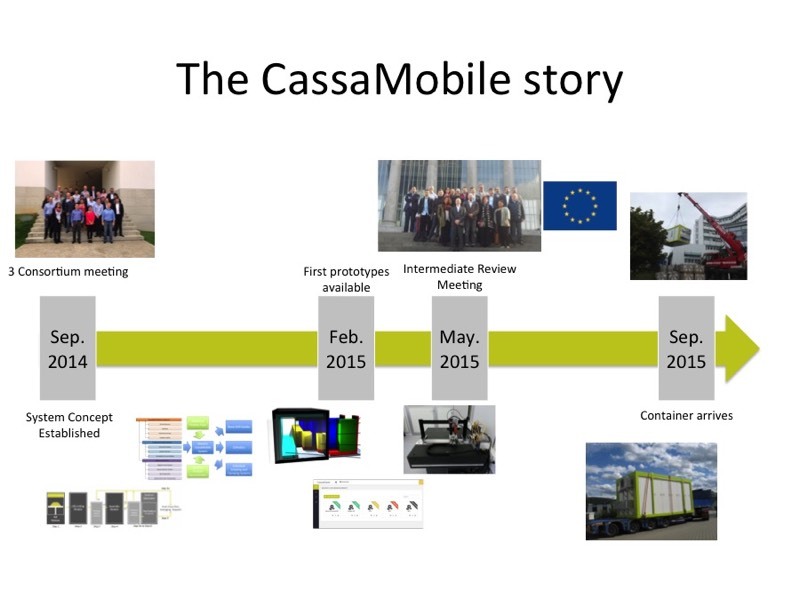 After this, the complete CassaMobile process chain will be ready for the live demonstration taking place in the frame of our Public Workshop on 24 August 2016 at the Fraunhofer Institute IPA in Stuttgart. 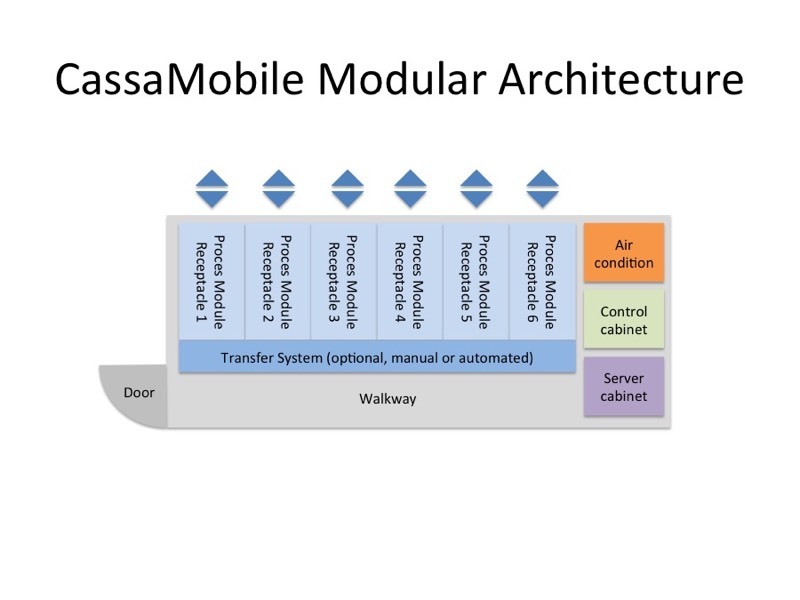 Under harsh conditions (snow, rain and cold temperature) the CassaMobile process chain has been integrated successfully. 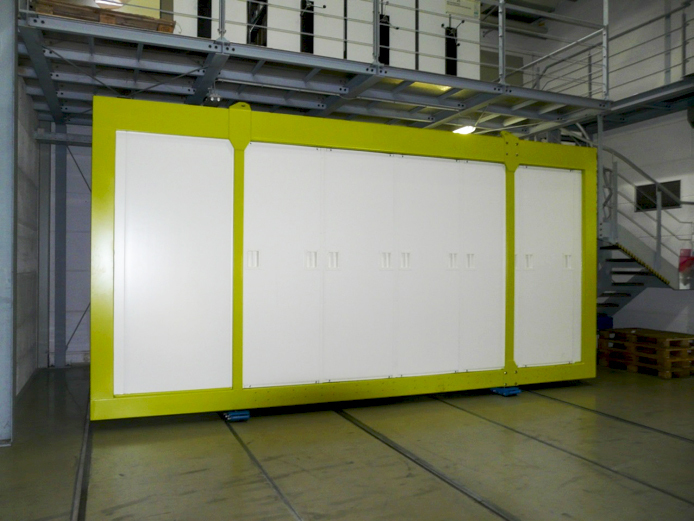 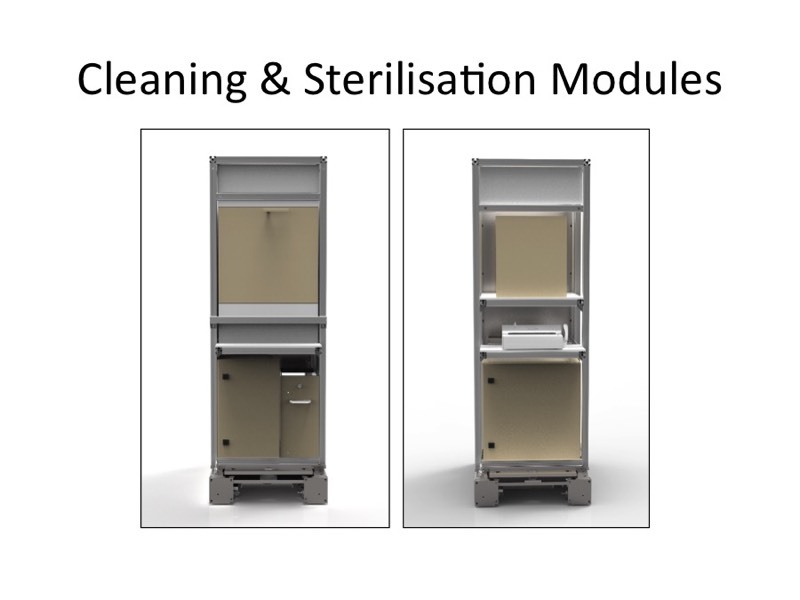 The remaining modules for assembly, cleaning and sealing have been installed and put into operation. 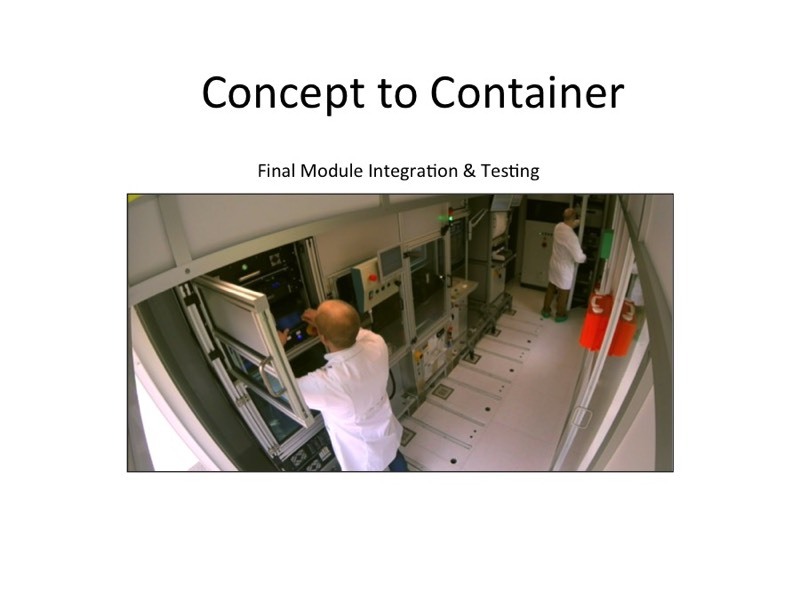 We will now merge the overall container software with the single module controls and prepare the first production under real conditions. 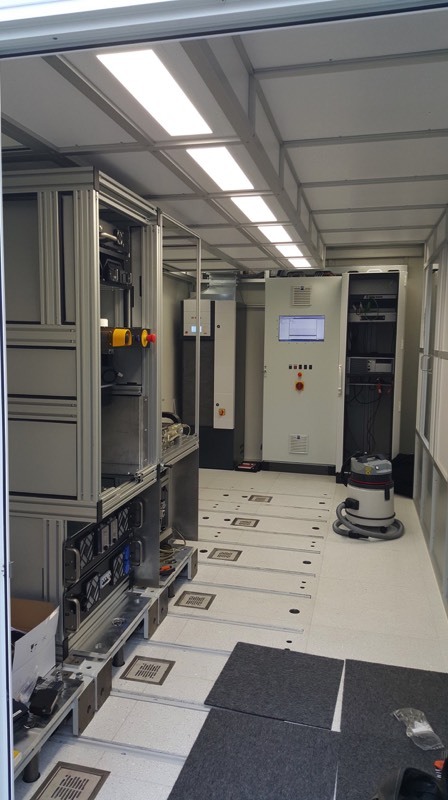 After the preparations in week 46, the first CassaMobile process modules (AM & CNC) have now been fully installed in the container. 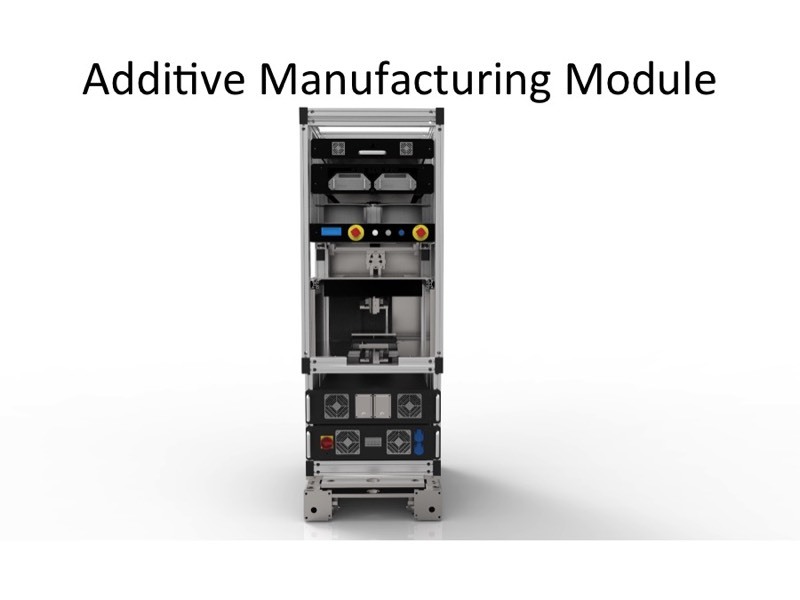 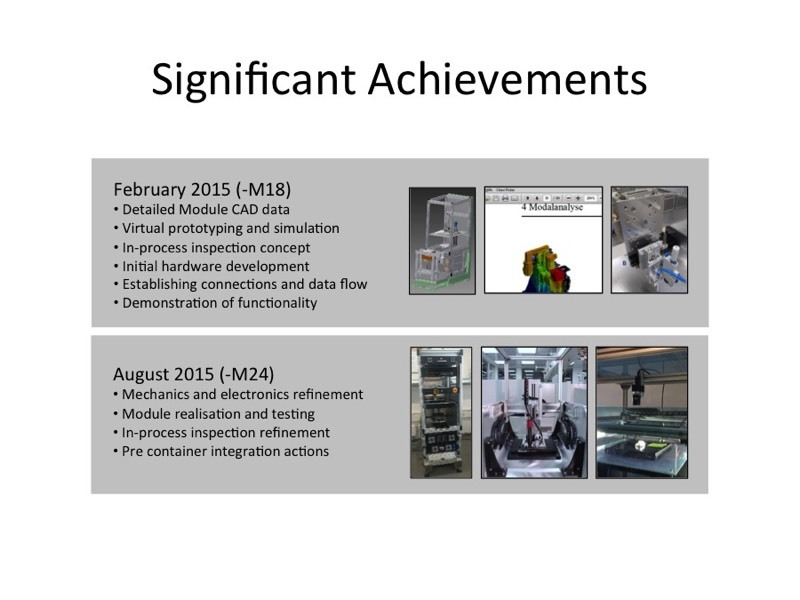 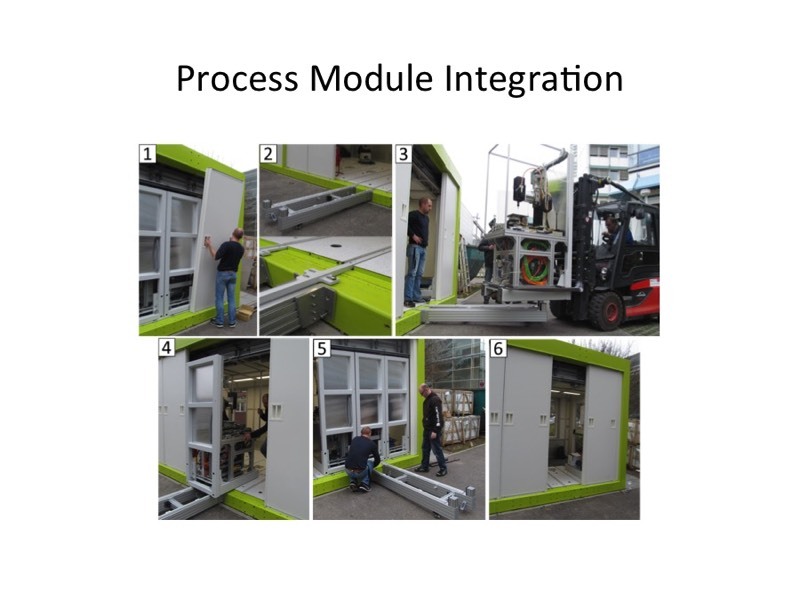 The installation of these process modules went smoothly and was completed within 45 minutes. 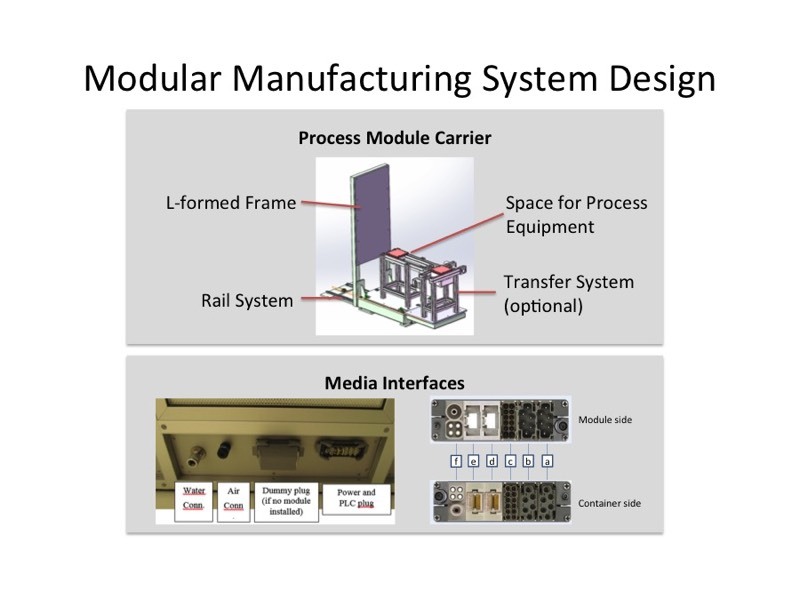 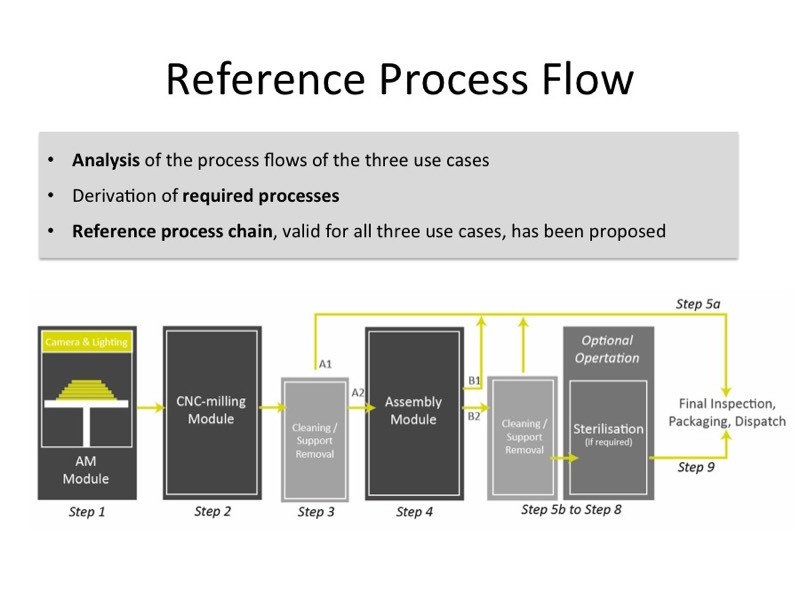 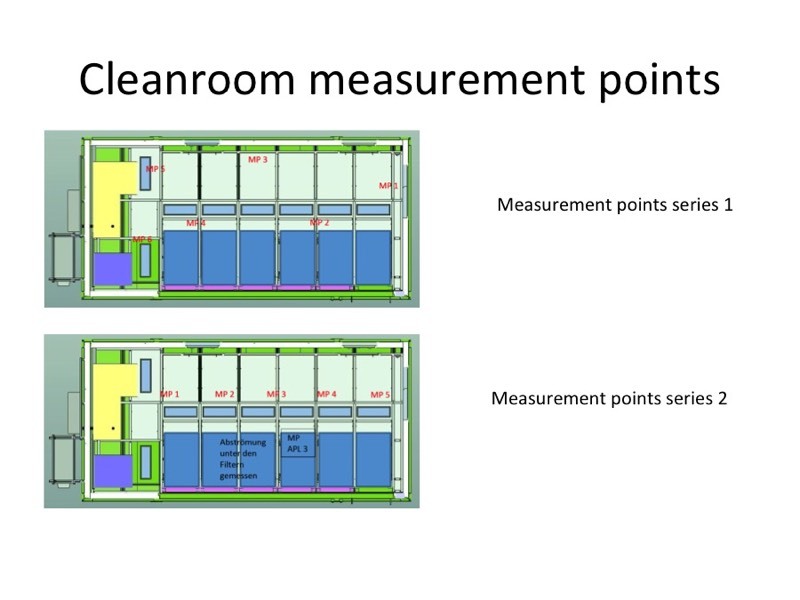 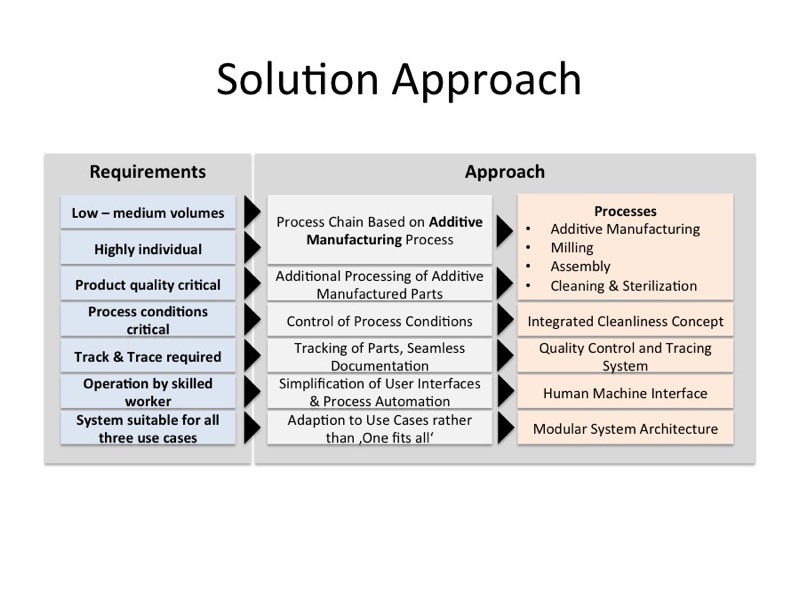 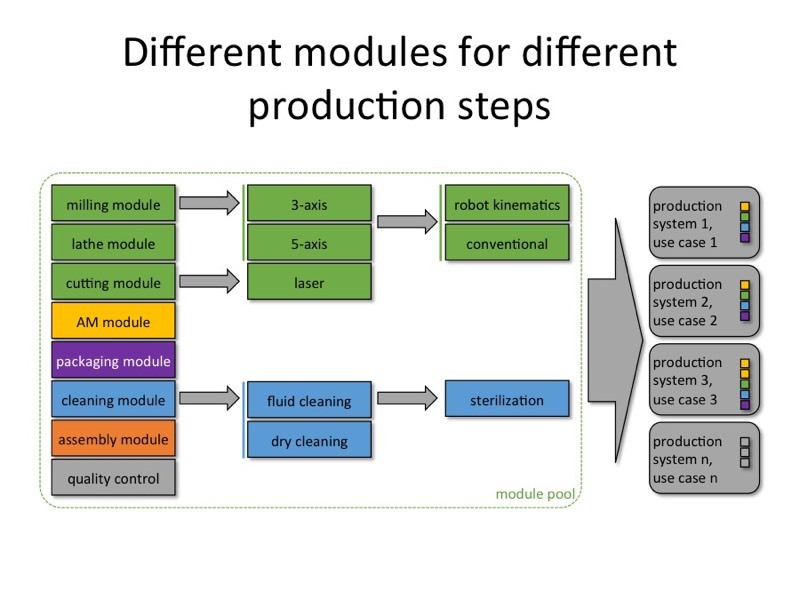 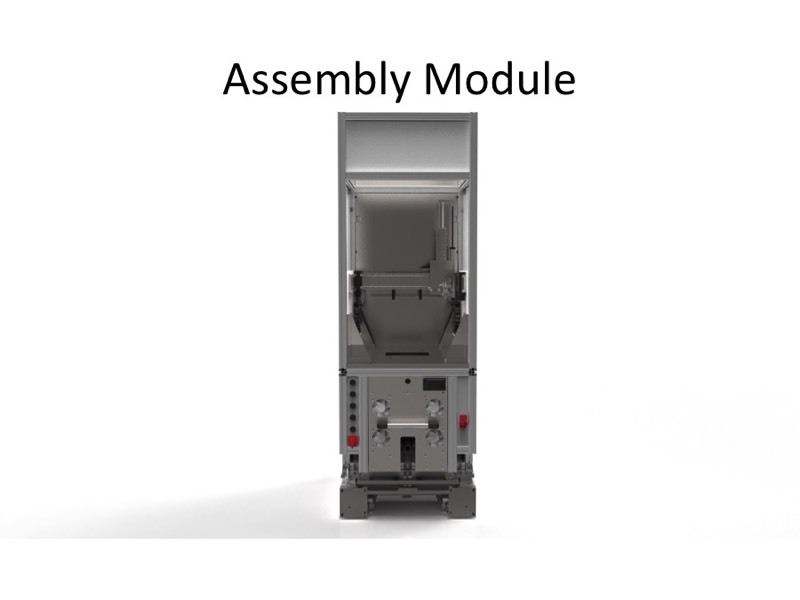 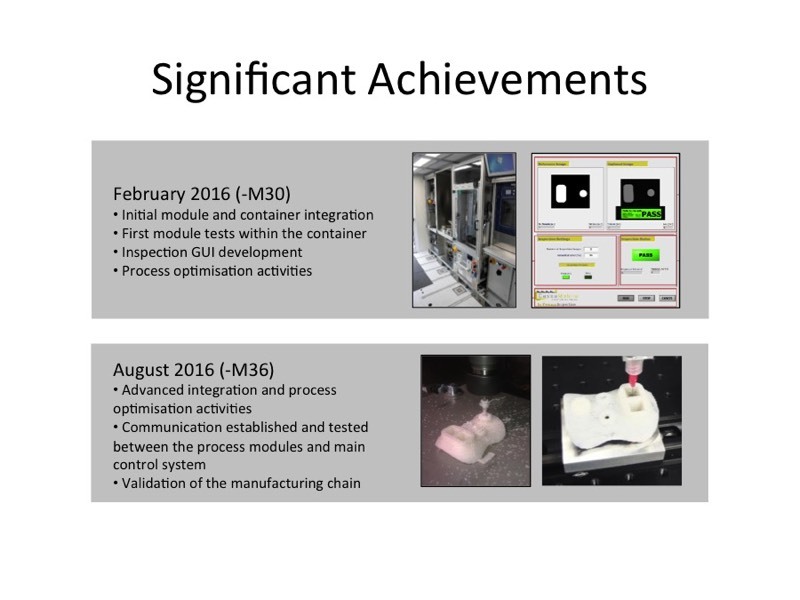 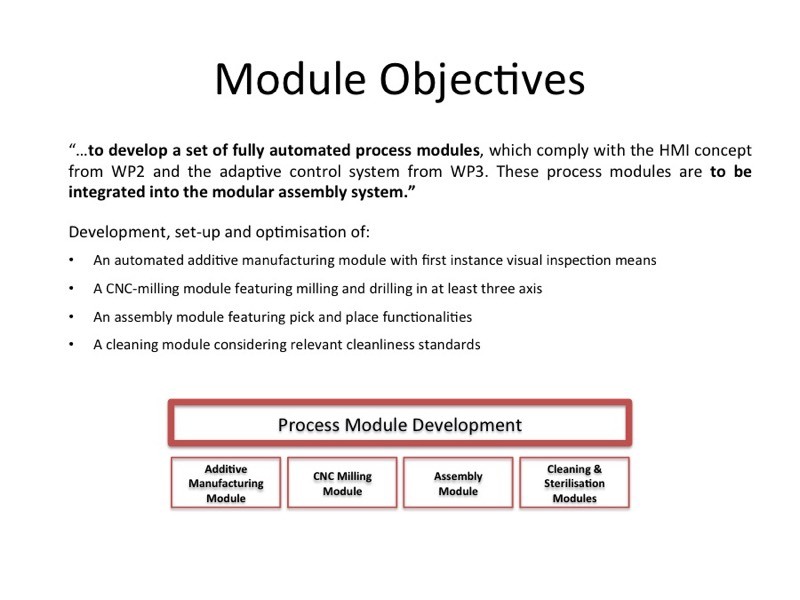 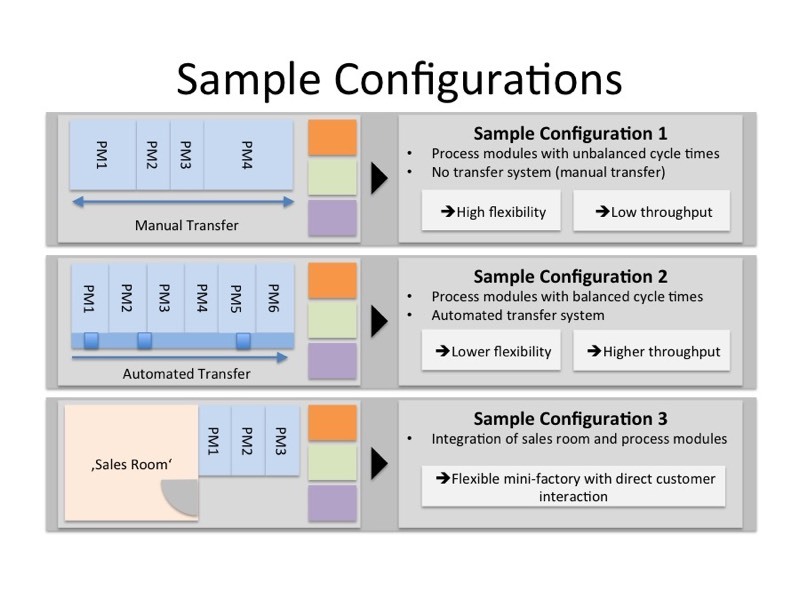 As these process modules are brought into service and integrated, the next process module (assembly) is being prepared. 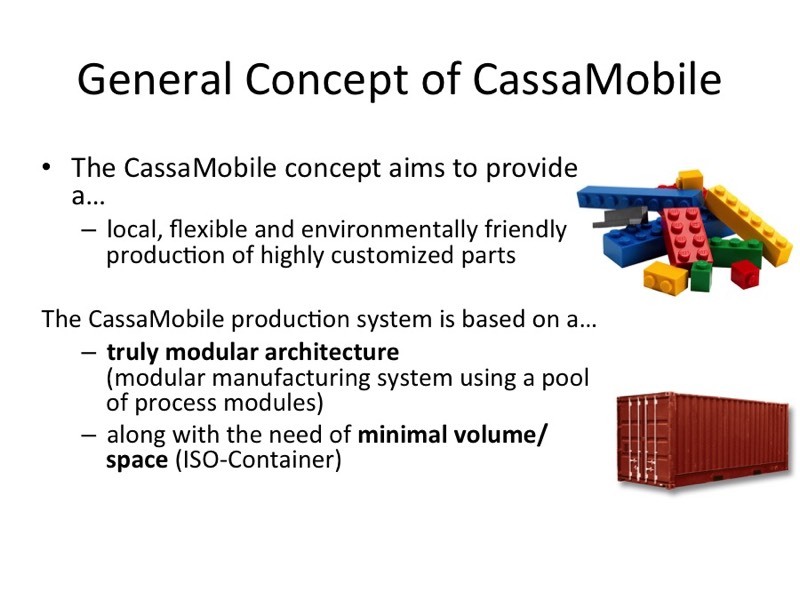 After the Christmas break, in week 3 of the new year, it will be integrated into the CassaMobile process chain. 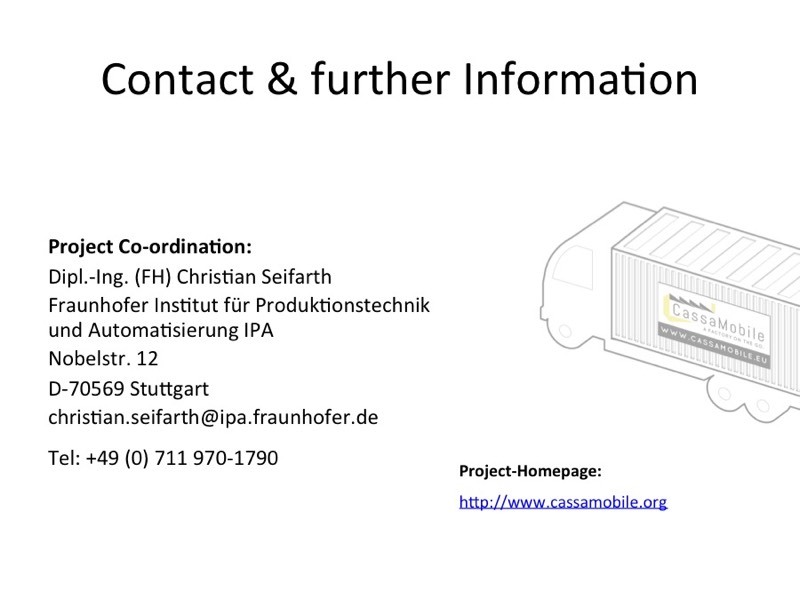 In case of questions please contact us directly. 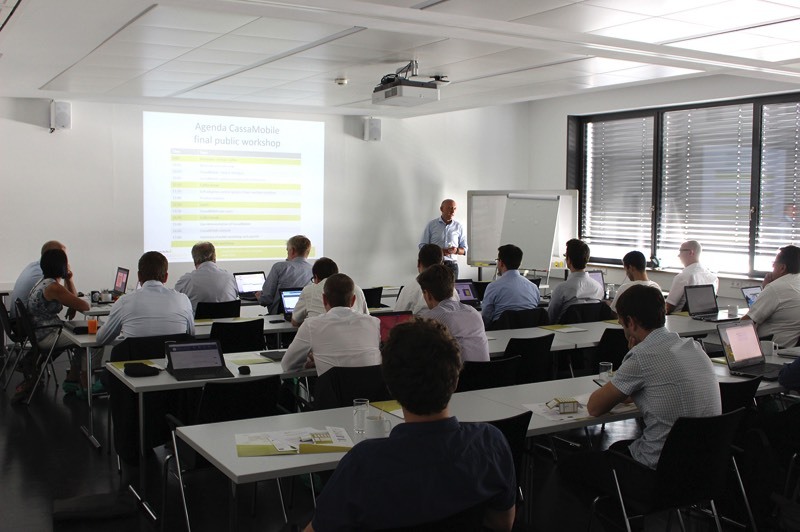 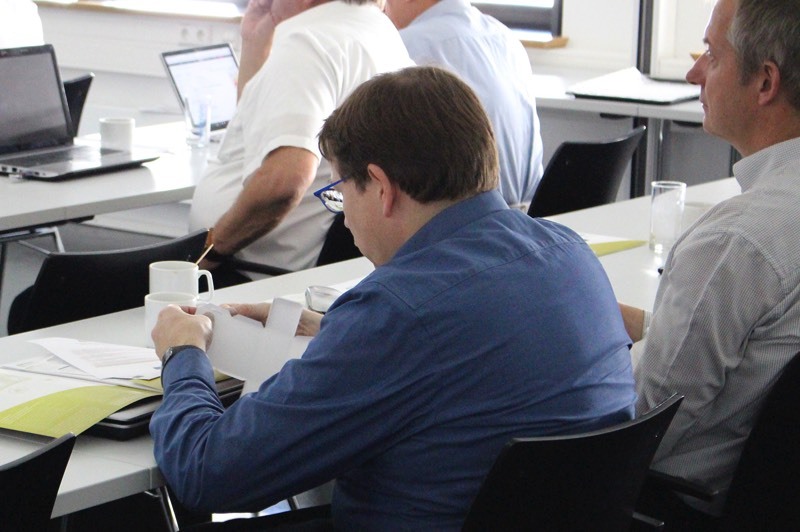 In October CassaMobile co-organized its first public workshop at the FhG facilities in Stuttgart. 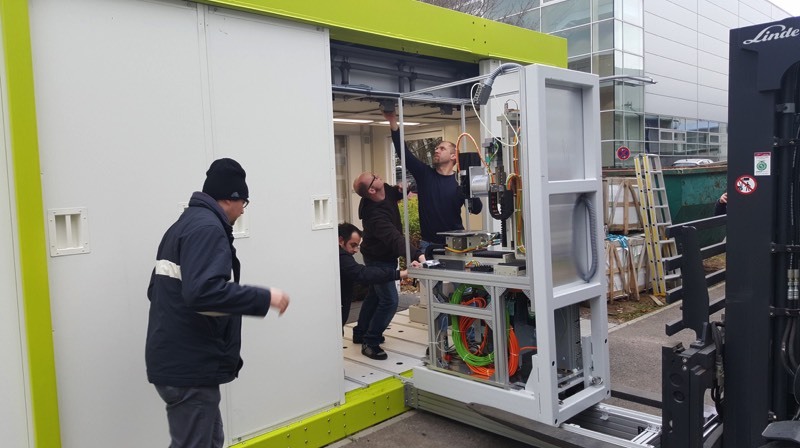 The workshop was concluded with an opportunity to view the CassaMobile container, now at FhG-IPA ready to receive the individual process modules being developed by the partners. 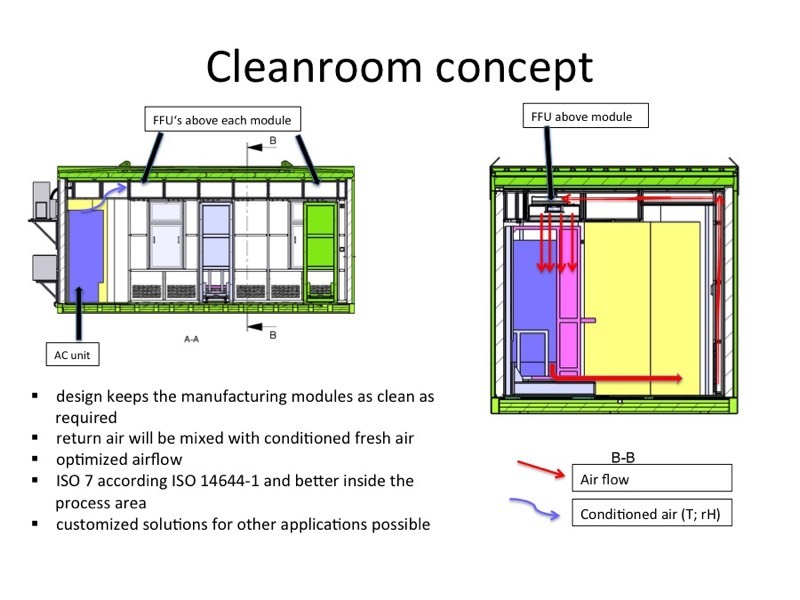 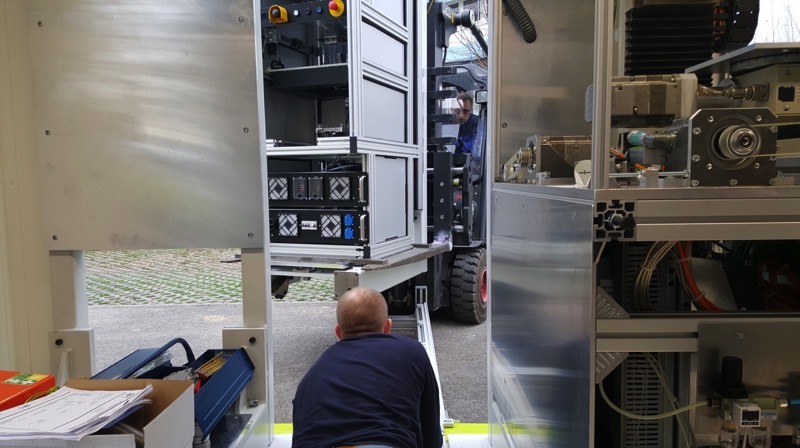 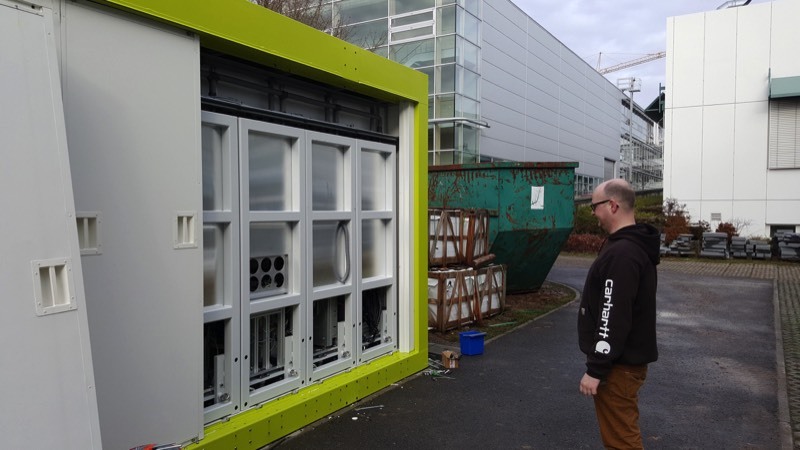 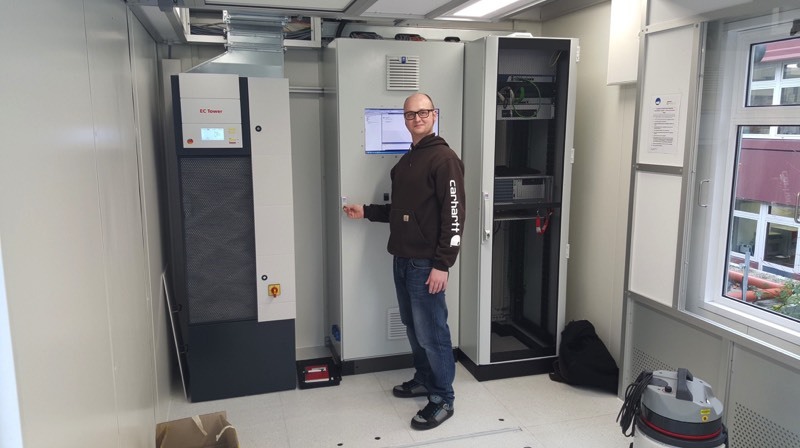 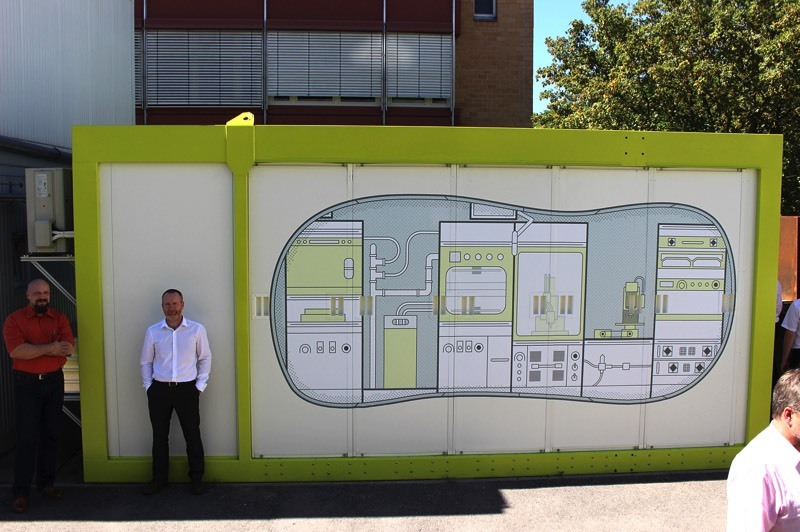 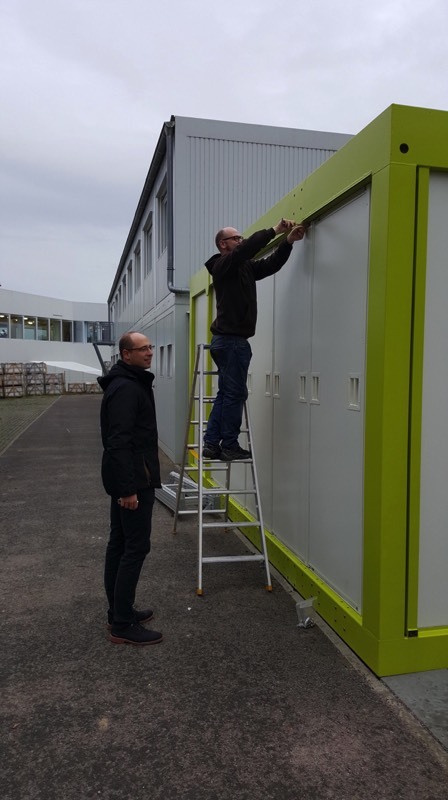 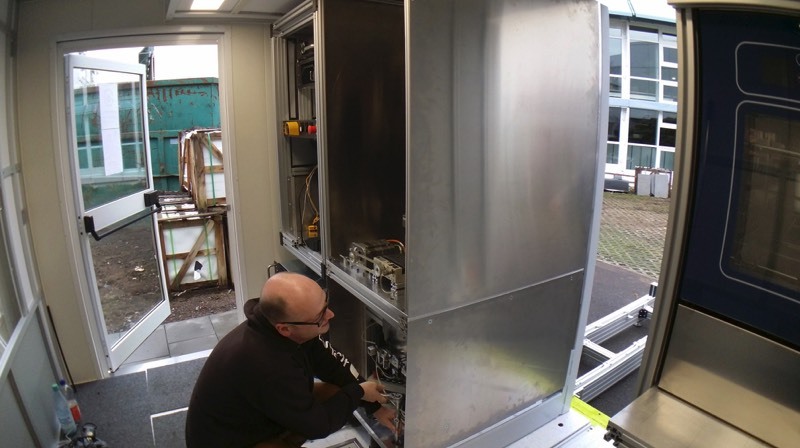 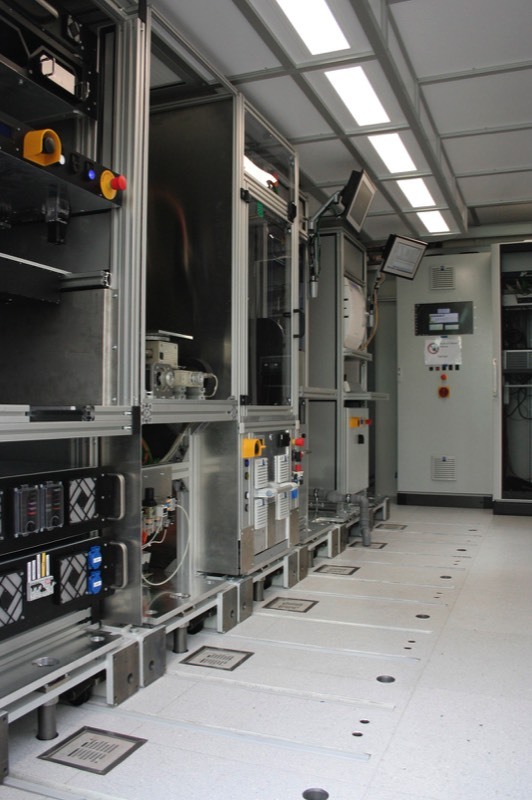 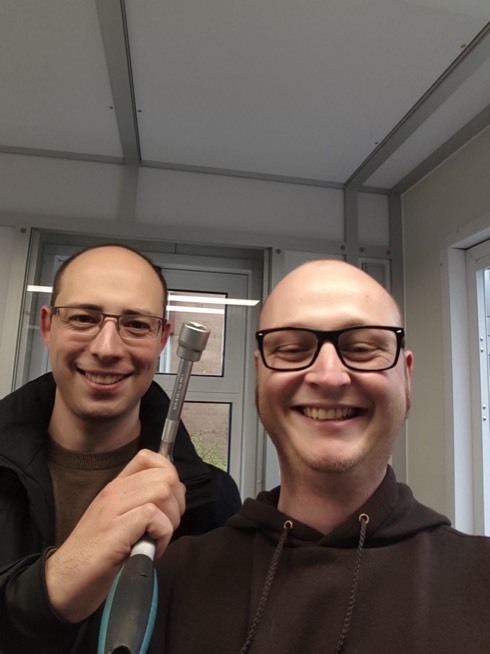 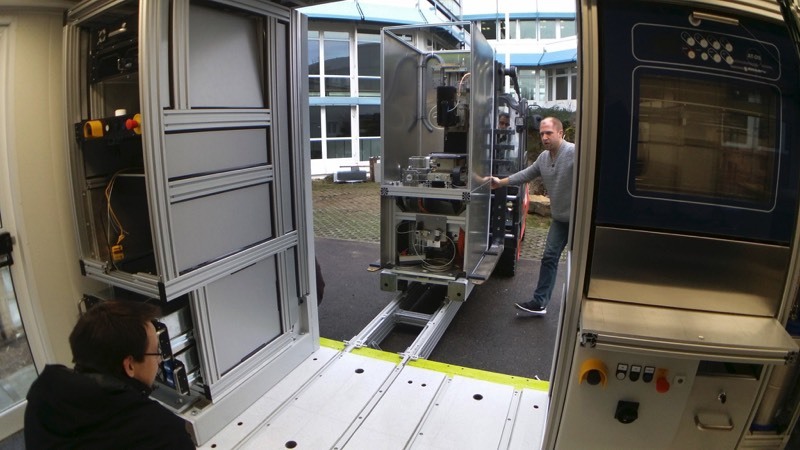 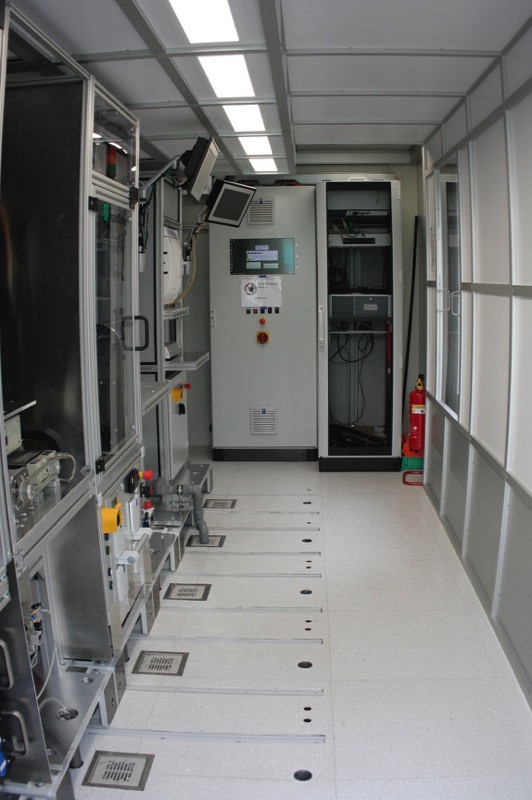 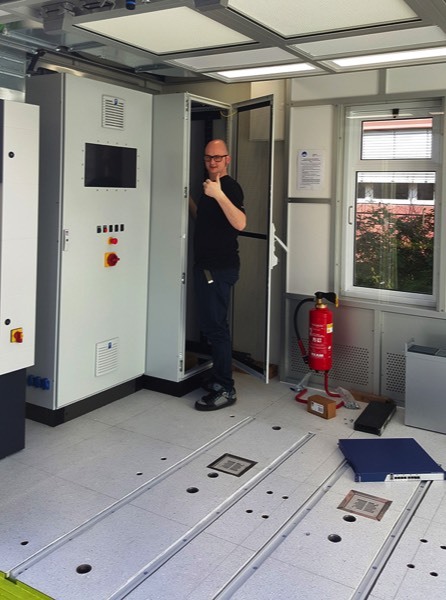 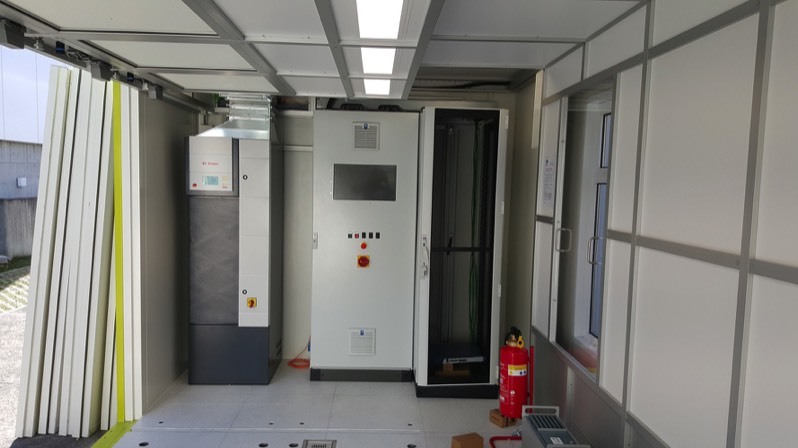 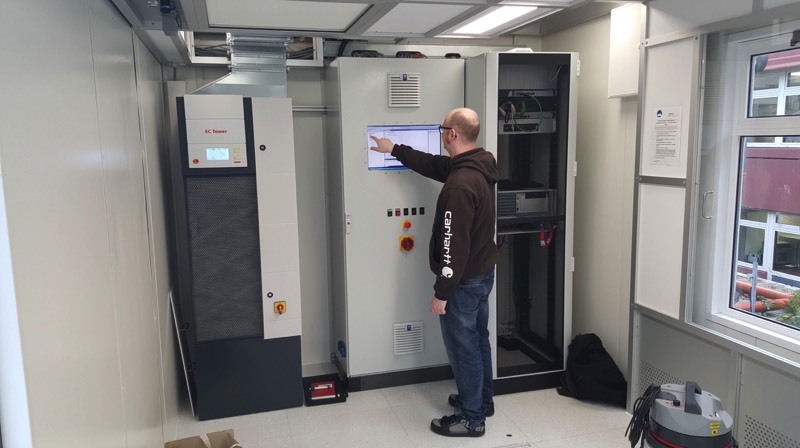 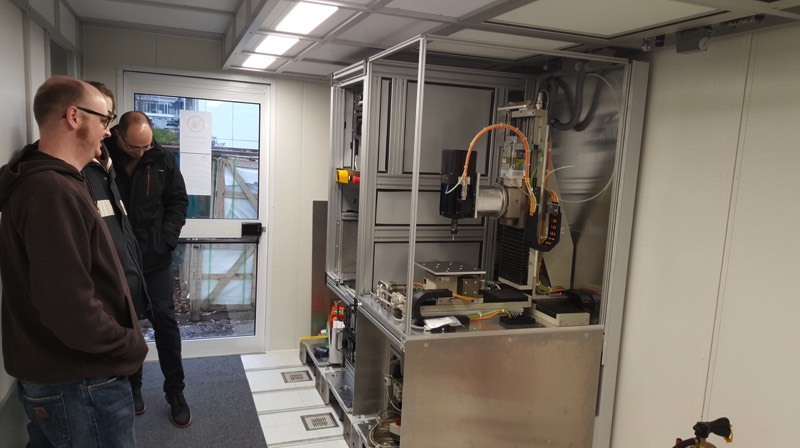 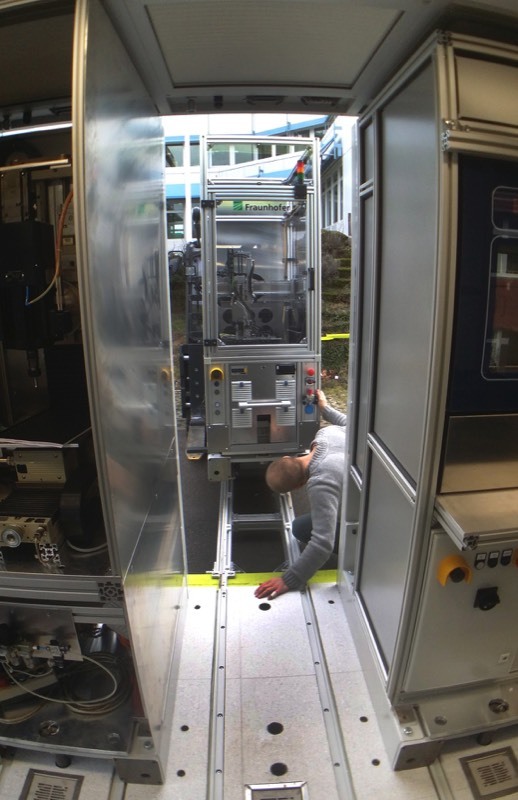 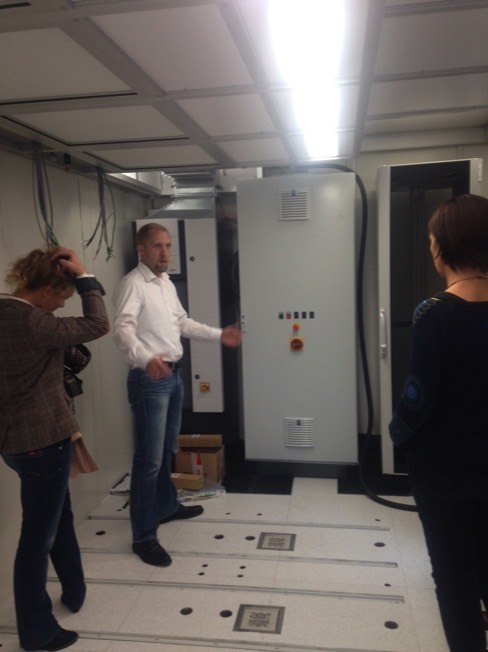 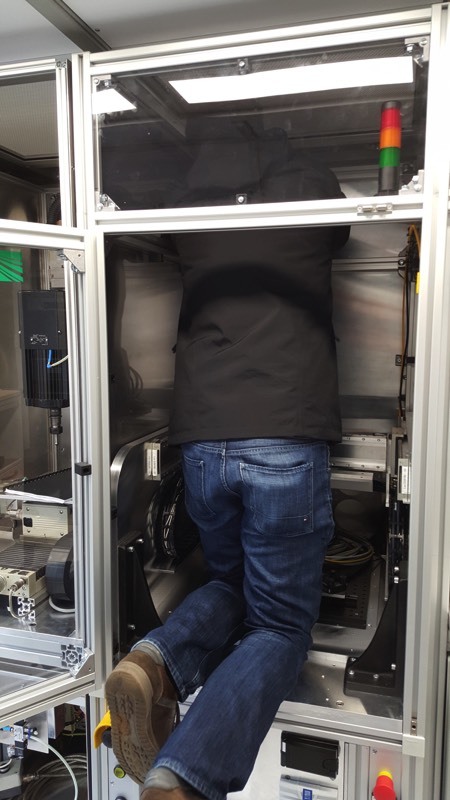 The images show Tim (FhG-IPA) proudly showing the CassaMobile container and Christian (FhG-IPA) explaining the module bays inside the container to visitors. 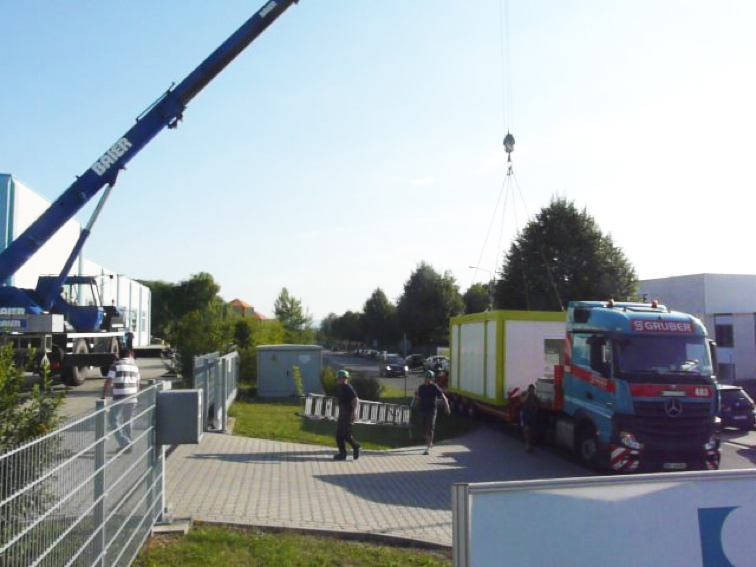 The container is in sight! 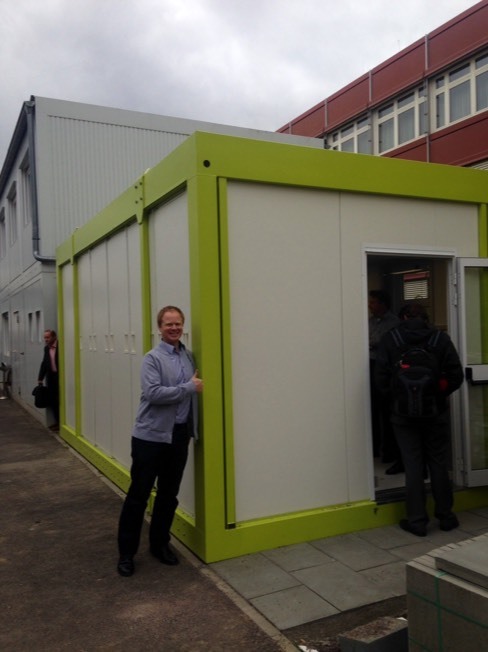 The container has arrived today at the Fraunhofer IPA facilities in Stuttgart, Germany! 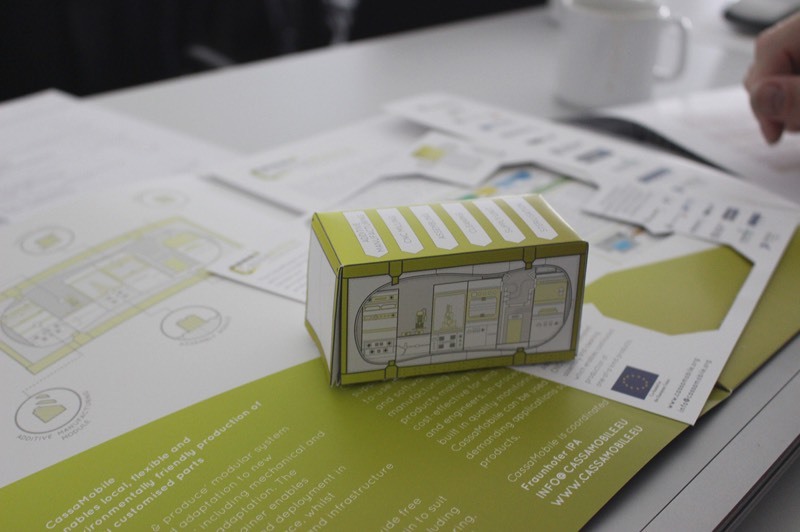 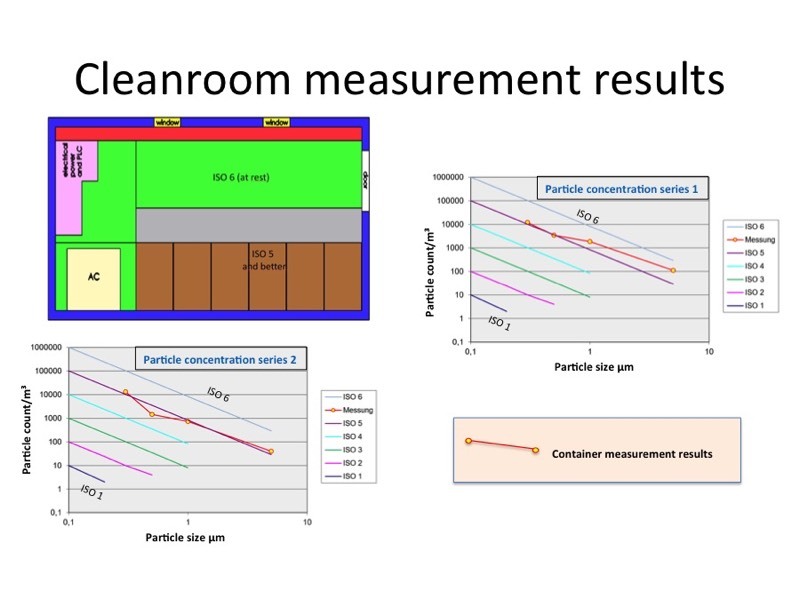 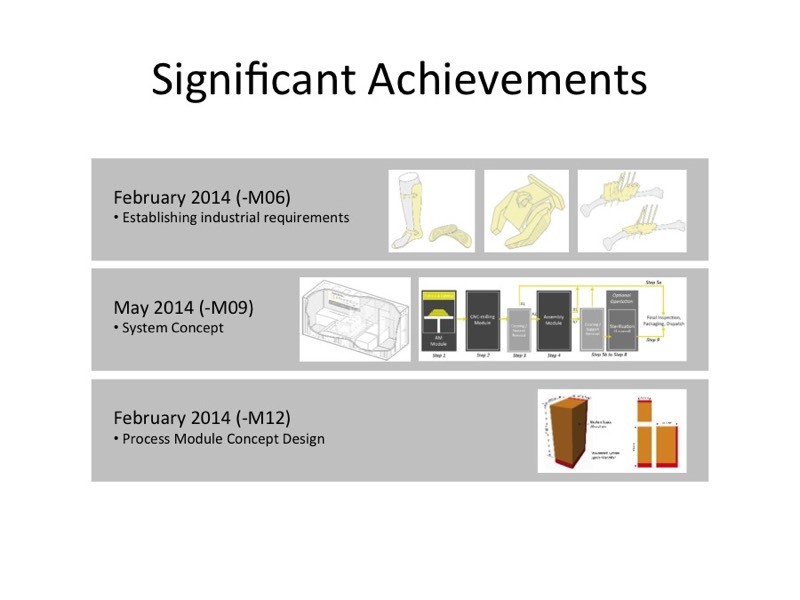 Below you can find a set of presentations that summarises the project final outcomes. 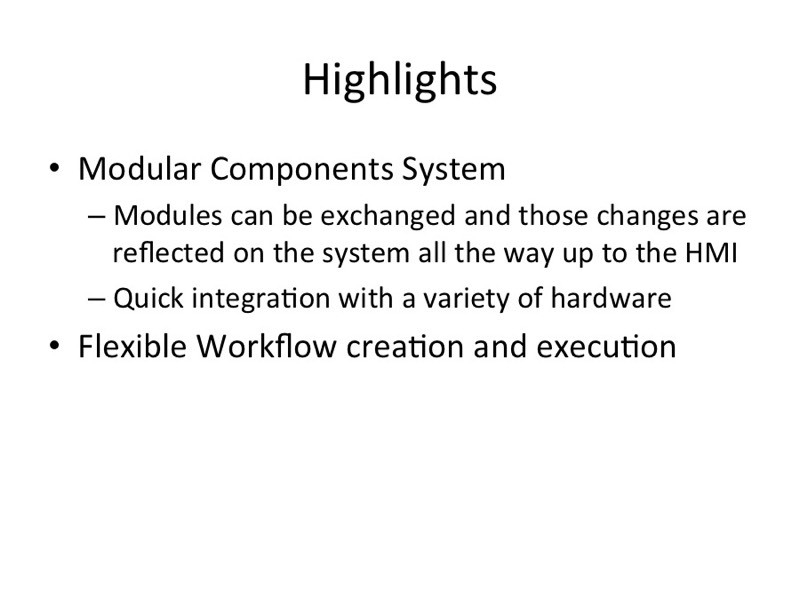 Just click on one of the titles to view the slides. 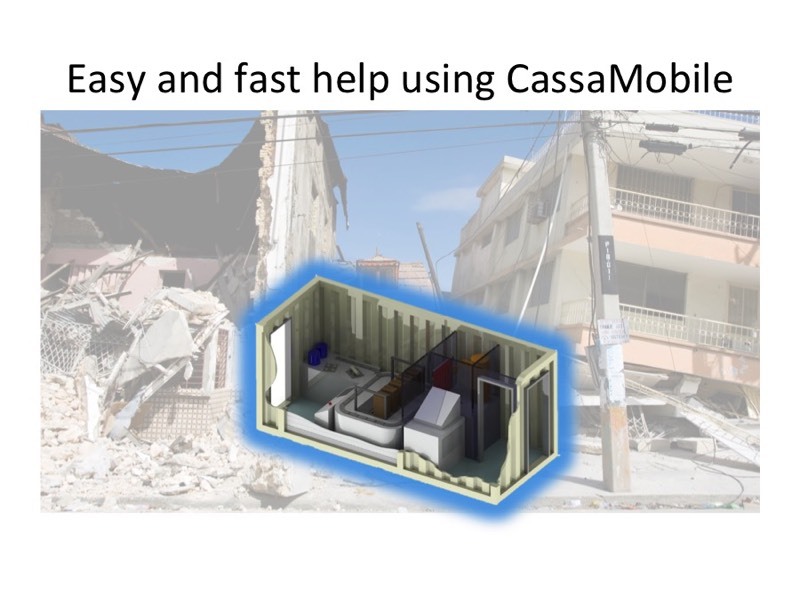 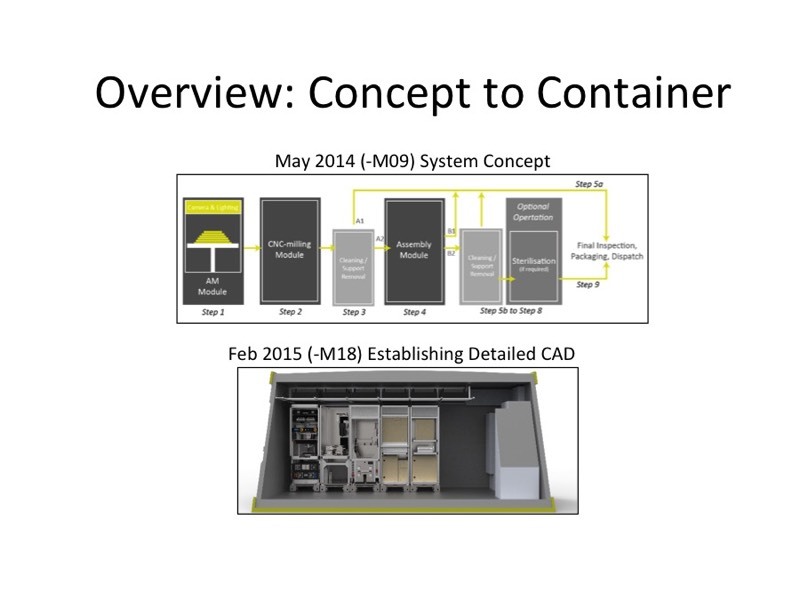 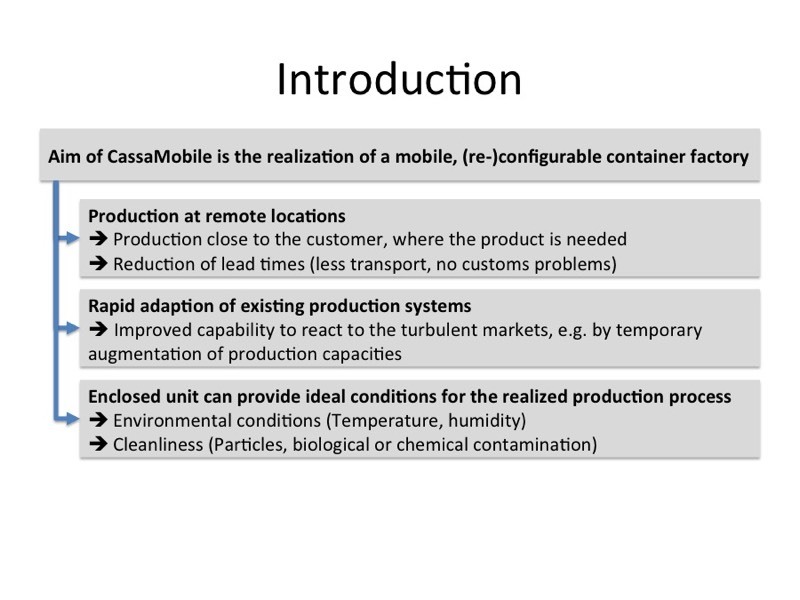 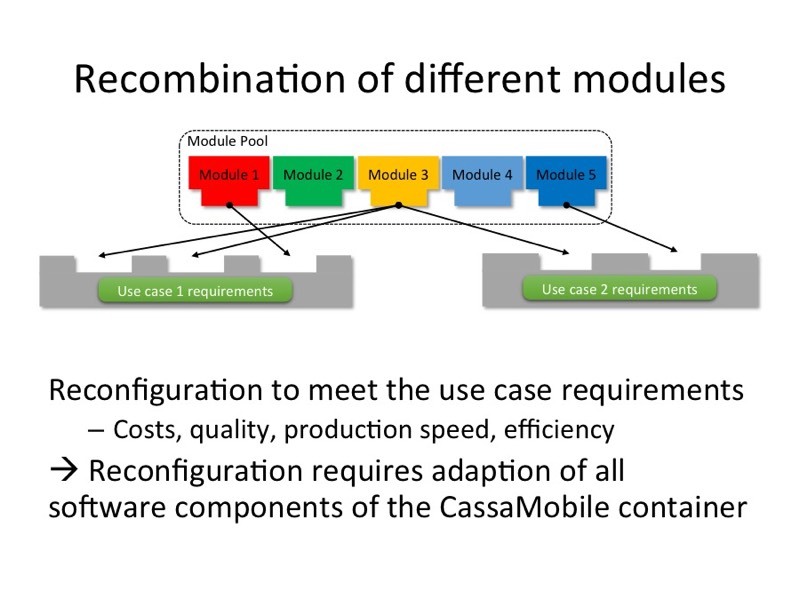 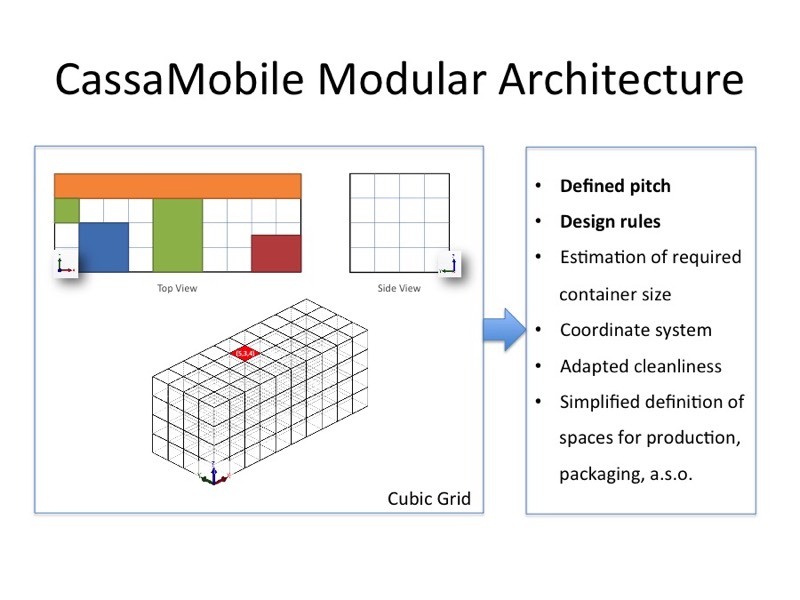 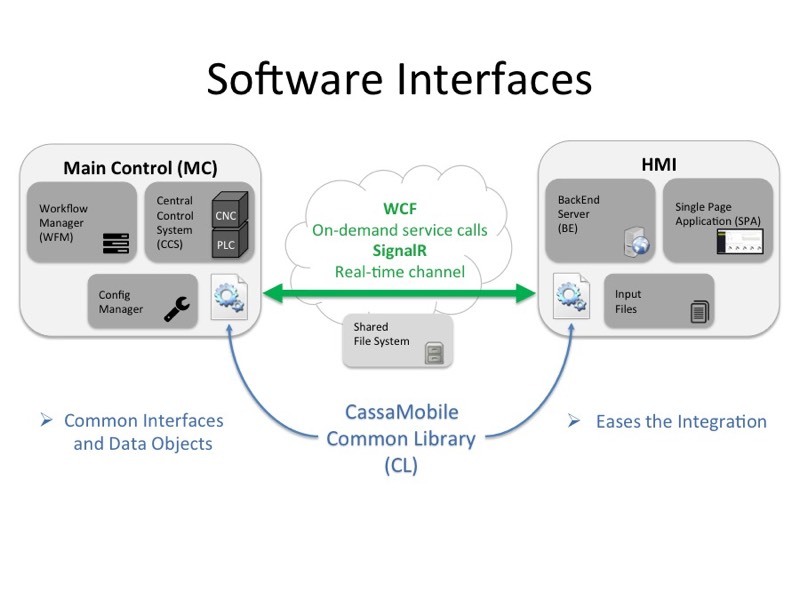 The video summarises the outcomes of CassaMobile and shows a live demonstration of all the modules working within the actual container. 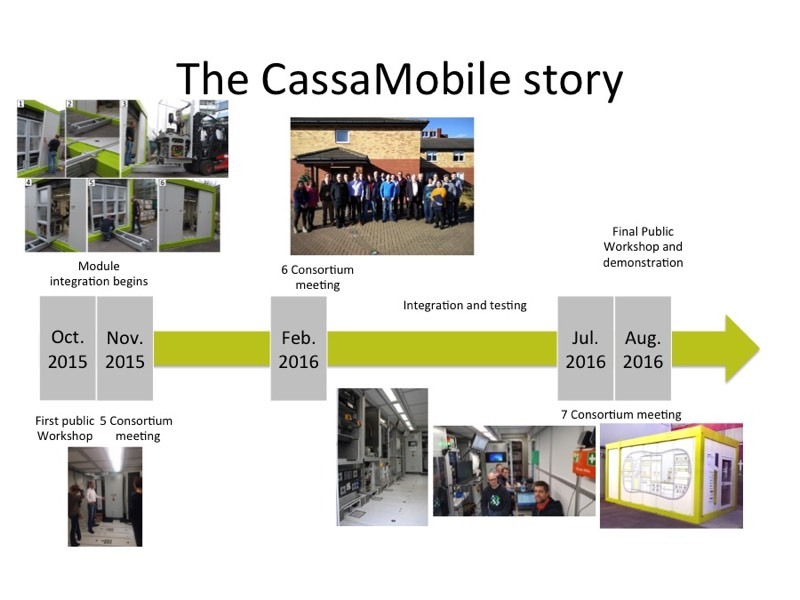 CassaMobile co-organized workshops and events in collaboration with other bodies and institutions. 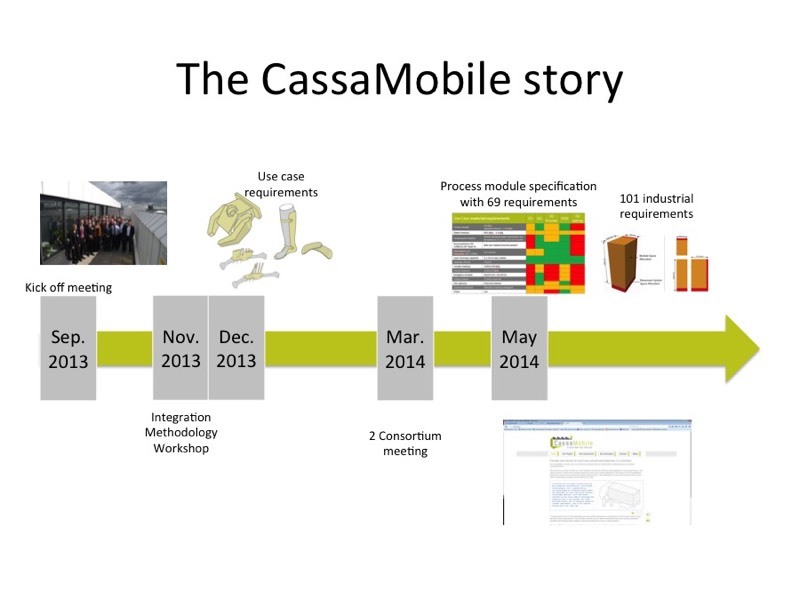 Download the public information about CassaMobile's research and its first outcomes. 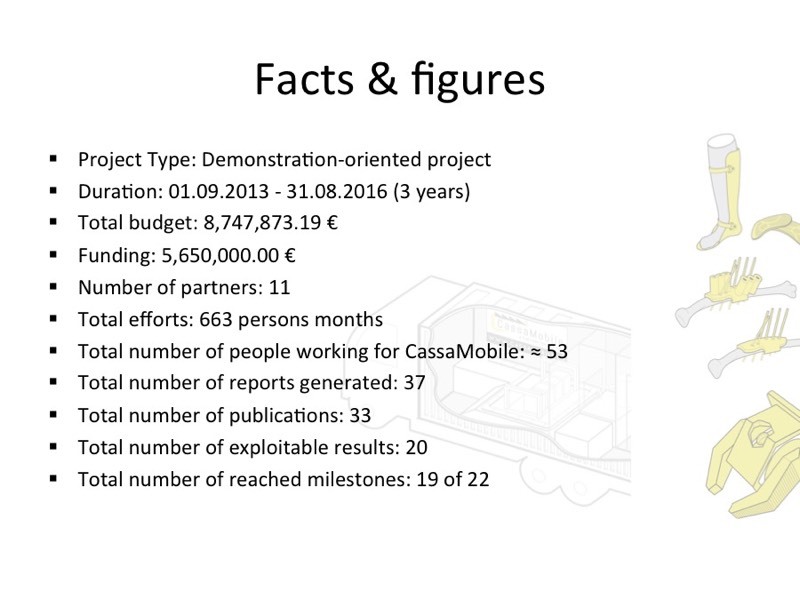 All CassaMobile-related scientific publications are listed here. 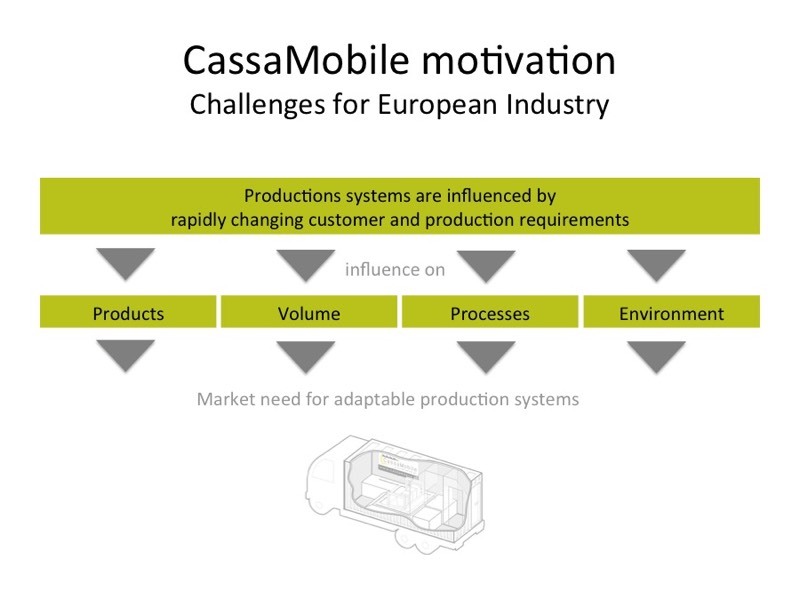 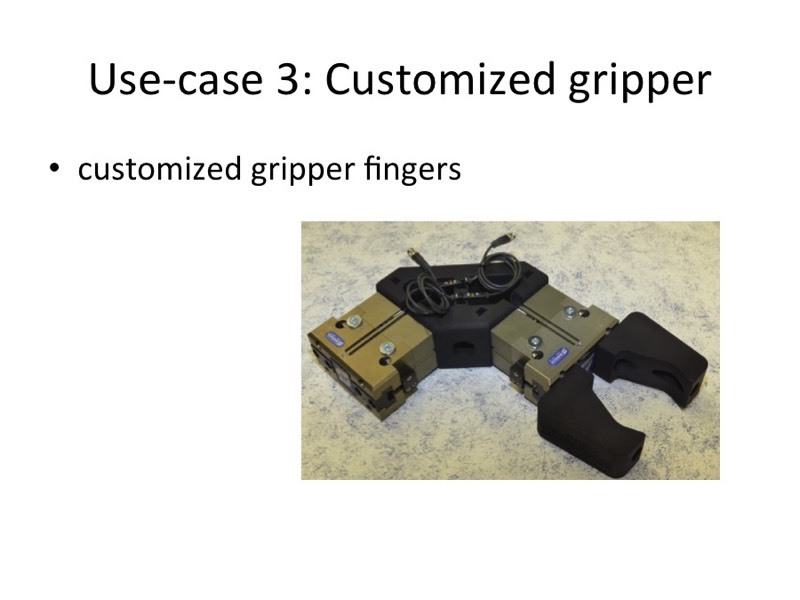 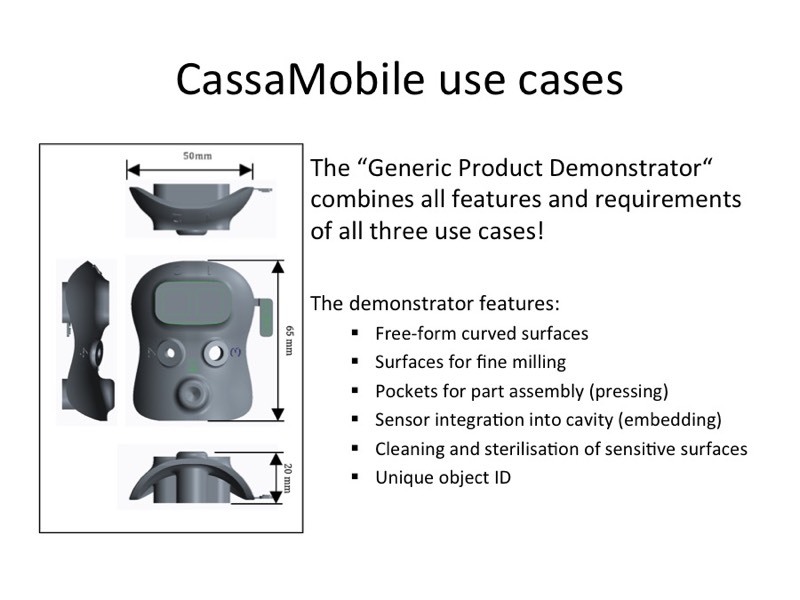 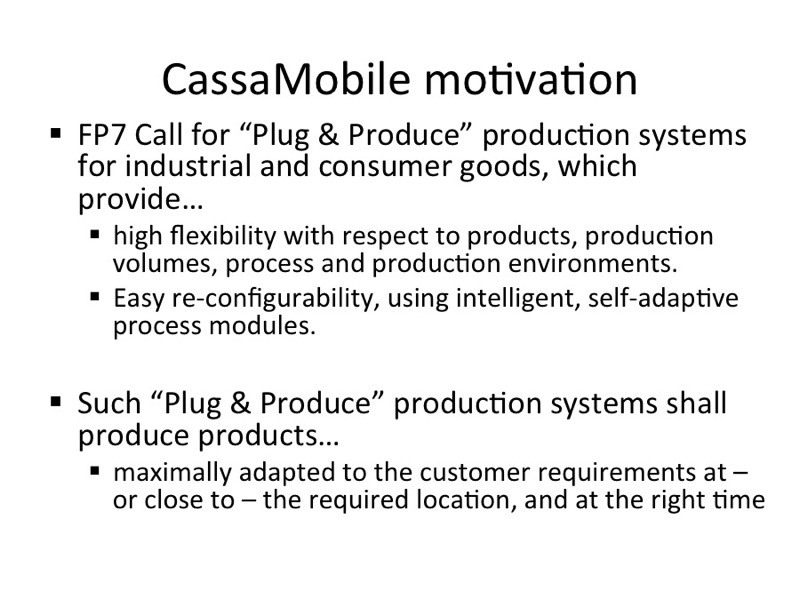 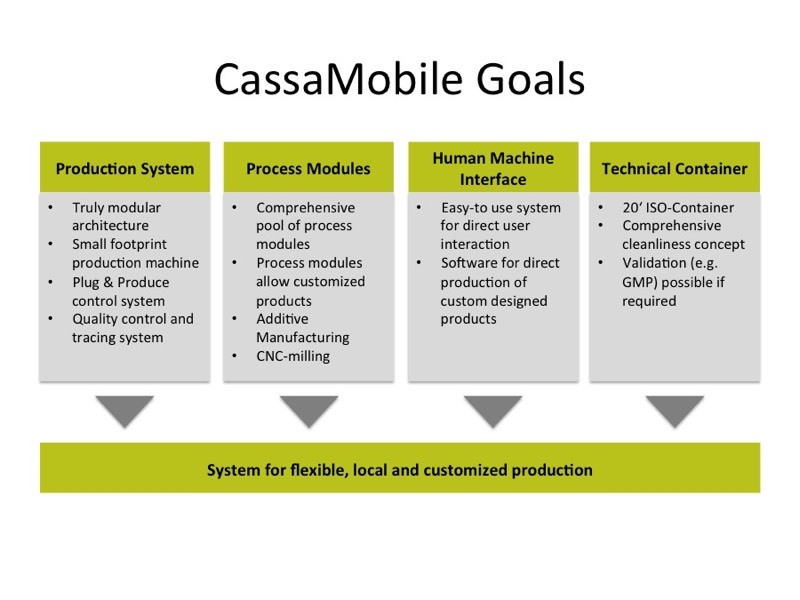 CassaMobile "mini-factories for customised products using local flexible production"
All CassaMobile-related presentations and lectures. 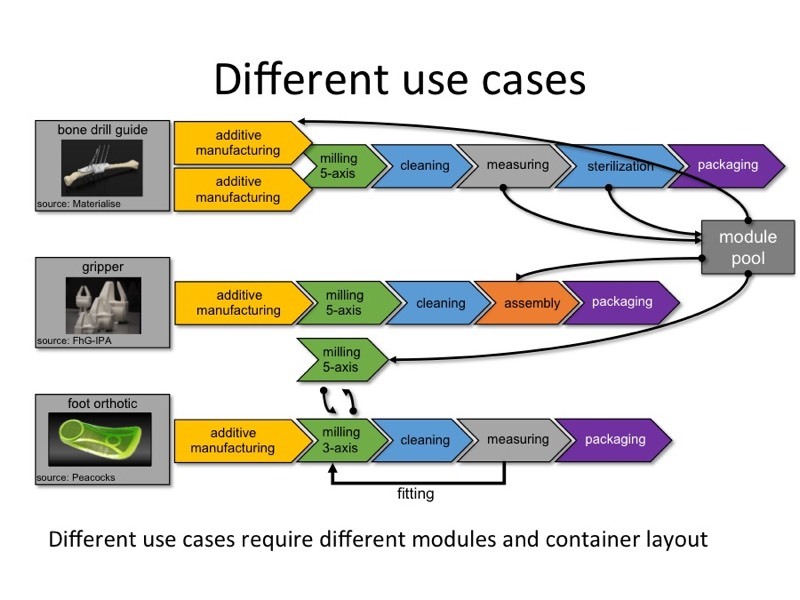 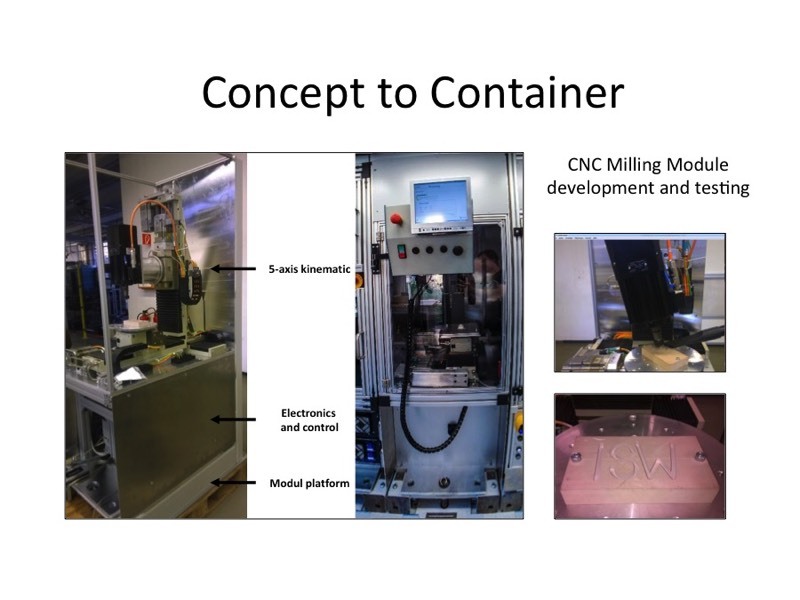 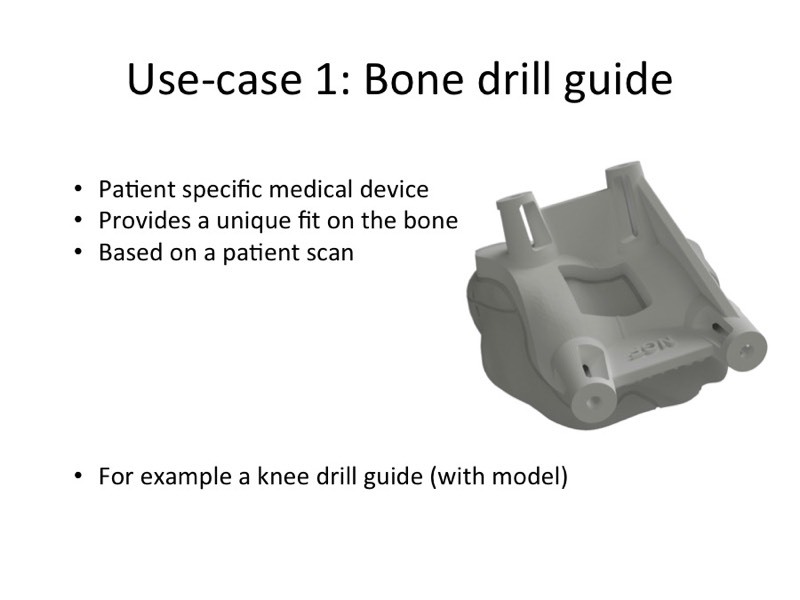 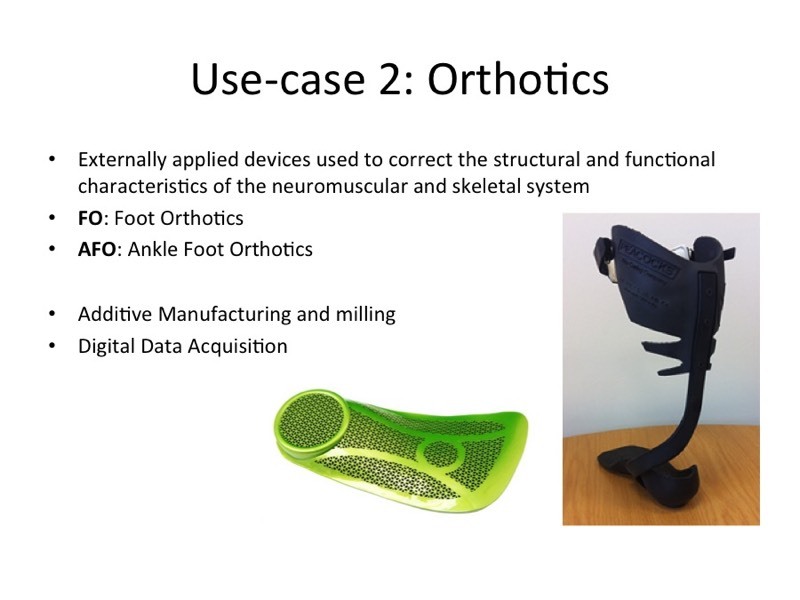 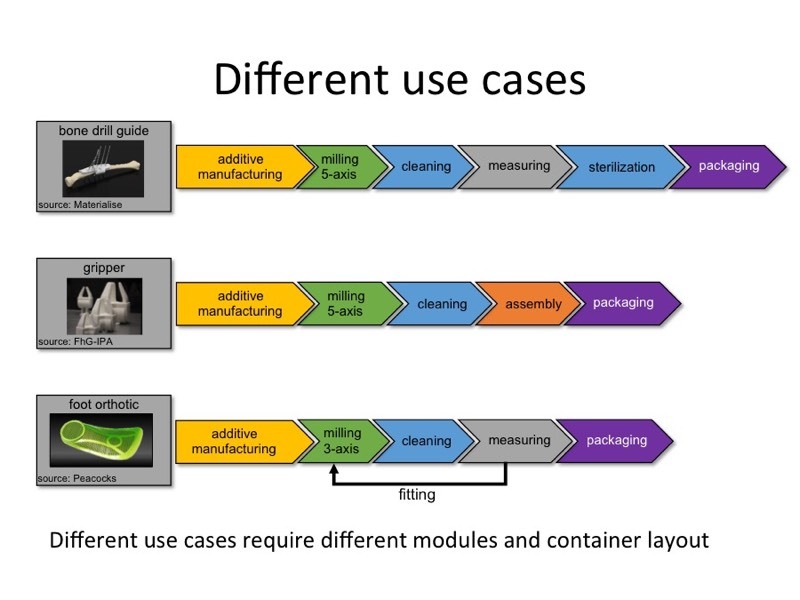 3D-Printing, Additive Manufacturing and P&O – Where are we now?